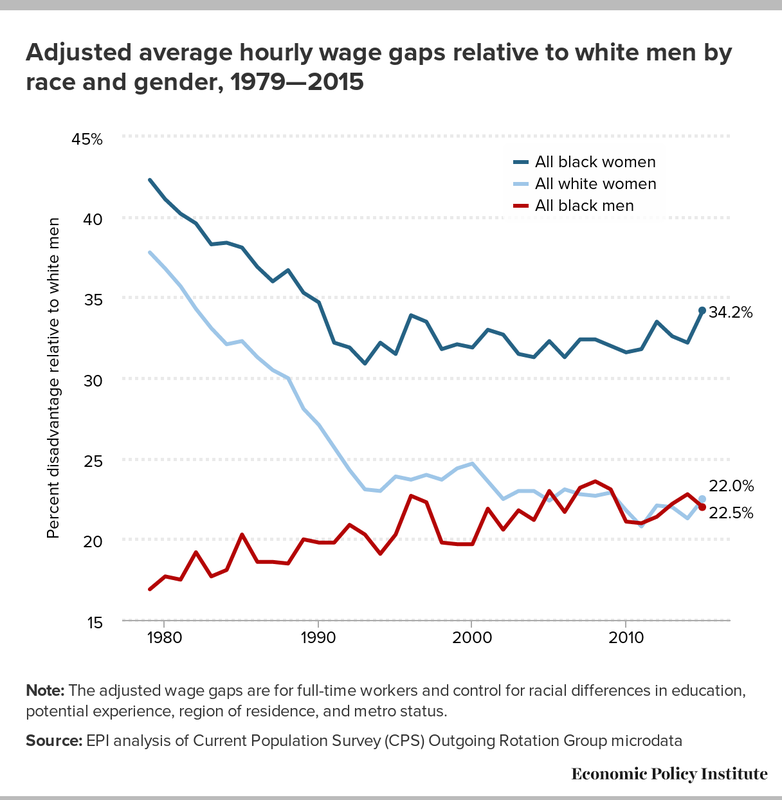 What this report finds: Black-white wage gaps are larger today than they were in 1979, but the increase has not occurred along a straight line. During the early 1980s, rising unemployment, declining unionization, and policies such as the failure to raise the minimum wage and lax enforcement of anti-discrimination laws contributed to the growing black-white wage gap. During the late 1990s, the gap shrank due in part to tighter labor markets, which made discrimination more costly, and increases in the minimum wage. Since 2000 the gap has grown again. As of 2015, relative to the average hourly wages of white men with the same education, experience, metro status, and region of residence, black men make 22.0 percent less, and black women make 34.2 percent less. Black women earn 11.7 percent less than their white female counterparts. The widening gap has not affected everyone equally. Young black women (those with 0 to 10 years of experience) have been hardest hit since 2000. Why it matters: Though the African American experience is not monolithic, our research reveals that changes in black education levels or other observable factors are not the primary reason the gaps are growing. For example, just completing a bachelor’s degree or more will not reduce the black-white wage gap. Indeed the gaps have expanded most for college graduates. Black male college graduates (both those with just a college degree and those who have gone beyond college) newly entering the workforce started the 1980s with less than a 10 percent disadvantage relative to white college graduates but by 2014 similarly educated new entrants were at a roughly 18 percent deficit. Consistently enforce antidiscrimination laws in the hiring, promotion, and pay of women and minority workers. Convene a high-level summit to address why black college graduates start their careers with a sizeable earnings disadvantage. Under the leadership of the Bureau of Labor Statistics, identify the “unobservable measures” that impact the black-white wage gap and devise ways to include them in national surveys. Urge the Equal Employment Opportunity Commission to work with experts to develop metropolitan area measures of discrimination that could be linked to individual records in the federal surveys so that researchers could directly assess the role that local area discrimination plays in the wage setting of African Americans and whites. Address the broader problem of stagnant wages by raising the federal minimum wage, creating new work scheduling standards, and rigorously enforcing wage laws aimed at preventing wage theft. Strengthen the ability of workers to bargain with their employers by combatting state laws that restrict public employees’ collective bargaining rights or the ability to collect “fair share” dues through payroll deductions, pushing back against the proliferation of forced arbitration clauses that require workers to give up their right to sue in public court, and securing greater protections for freelancers and workers in “gig” employment relationships. Require the Federal Reserve to pursue monetary policy that targets full employment, with wage growth that matches productivity gains. Income inequality and slow growth in the living standards of low- and moderate-income Americans have become defining features of today’s economy, and at their root is the near stagnation of hourly wage growth for the vast majority of American workers. Since 1979, wages have grown more slowly than productivity—a measure of the potential for wage growth—for everyone except the top 5 percent of workers, while wage growth for the top 1 percent has significantly exceeded the rate of productivity growth (Bivens and Mishel 2015). This means that the majority of workers have reaped few of the economic rewards they helped to produce over the last 36 years because a disproportionate share of the benefits have gone to those at the very top. While wage growth lagging behind productivity has affected workers from all demographic groups, wage growth for African American workers has been particularly slow. As a result, large pay disparities by race have remained unchanged or even expanded. This study describes broad trends and patterns in black-white wage inequality and examines the factors driving these trends as the growing wedge between productivity growth and wage growth has emerged. We do so by updating and extending similar analyses that dominated the literature from the 1960s through the 1990s. The analysis is performed for men and women overall, as well as by experience and educational attainment, during the 1980s, 1990s, and post-2000. In this report, the black-white wage gap is the percent by which wages of black workers lag wages of their white peers. (It is also often expressed in academic and popular literature as an earnings ratio—black workers’ share of white workers’ earnings—by subtracting the gap from 100 percent.) Our major contribution to the existing research is an assessment of the pattern or trend in the black-white wage gap for men since the late 1990s and for women since the late 1980s. 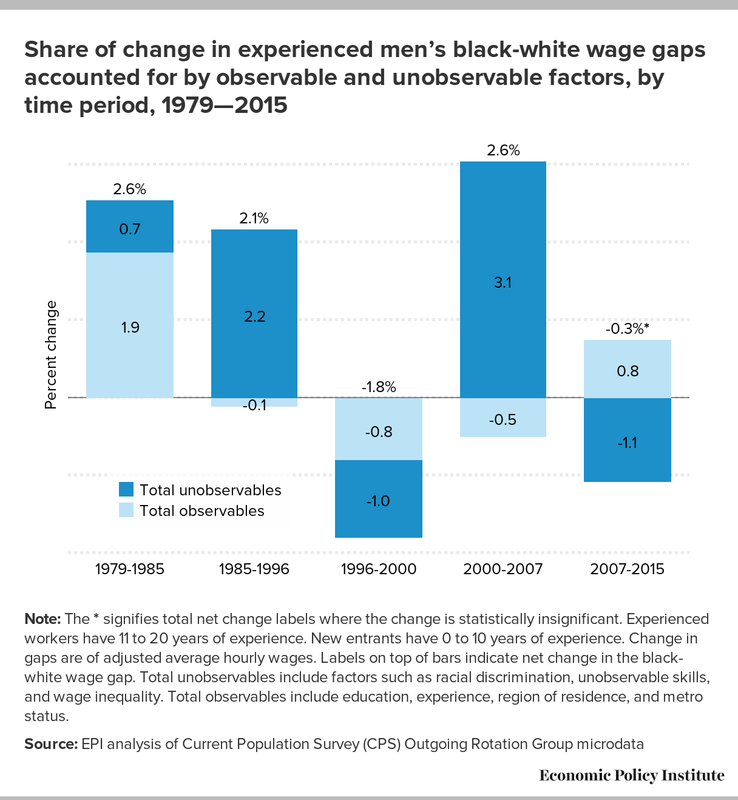 In addition to filling this void in the research on racial wage gaps, our analysis also affirms previous studies showing that the black-white wage gap among men expanded during the 1980s and narrowed significantly during the 1990s. Our primary finding is that there continues to be no single African American economic narrative. 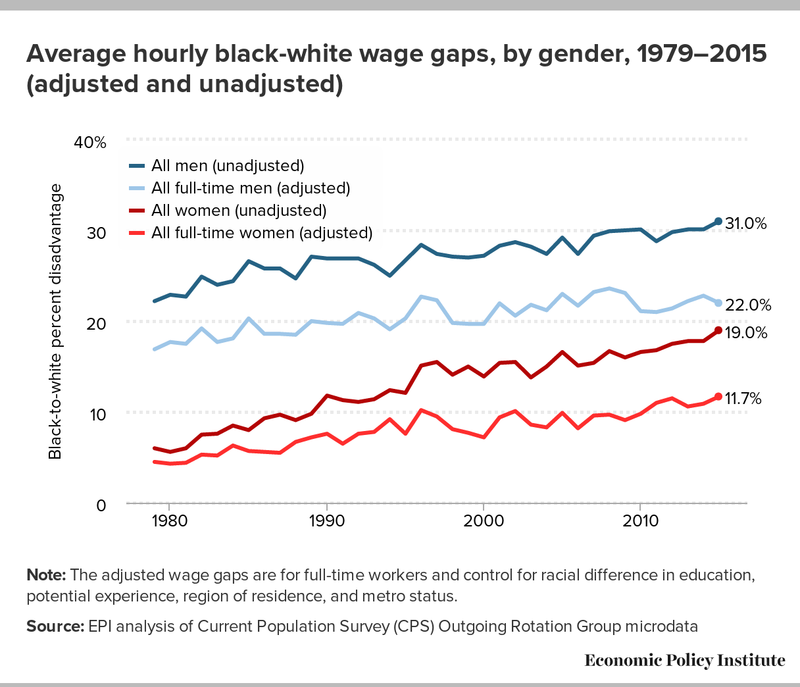 Black-white wage gaps are larger today than they were in 1979, but the increase has not occurred along a straight line, nor has it affected everyone equally. Indeed, the post-2000 patterns show that the diversity of experiences has expanded. While young black women newly entering the workforce have fallen furthest behind their white counterparts since 2000, the work experience of older African Americans continues to partially insulate them from macroeconomic and structural factors associated with growing racial inequality. However, this is cold comfort for members of this older cohort who experienced a major loss in their relative wages during the early 1980s, when many of them were first entering the labor market. They have yet to fully recover from the damage of the 1981–1982 recession and the cutbacks, in the 1980s, to political and financial resources to fight labor market discrimination. We also show that changes in unobservable factors—such as racial wage discrimination, racial differences in unobserved or unmeasured skills, or racial differences in labor force attachment of less-skilled men due to incarceration—along with weakened support to fight labor market discrimination continue to be the leading factors for explaining past and now the recent deterioration in the economic position of many African Americans. The black-white wage gap has widened more among women but it is still larger among men. Black men’s average hourly wages were 22.2 percent lower than those of white men in 1979 and declined to 31.0 percent lower by 2015. With an average hourly wage gap of 6.0 percent, black women were near parity with white women in 1979, but by 2015 this gap had grown to 19.0 percent. Differences in observable factors such as education and experience levels can explain more than a quarter of the black-white wage gap for men and over a third of the gap for women. The average (unadjusted) differences in pay between blacks and whites are partially explained by racial differences in education and experience as well as the fact that black workers are more concentrated in the South and in urban areas. These differences account for a fairly consistent portion of the estimated gaps among men (from 5.3 of 22.2 percentage points in 1979 to 9.0 of 31.0 percentage points in 2015), but account for a growing portion of the estimated gaps among women over time (from 1.5 of 6.0 percentage points in 1979 to 7.3 of 19.0 percentage points in 2015). Although racial differences in pay are smaller among women than men, black women face a large disadvantage associated with gender differences in pay. In 1979, black women’s wages were 42.3 percent lower than those of white men and 25.4 percent lower than those of black men. By 2015, these differences had narrowed, but remain significant—34.2 percent and 12.2 percent lower than white and black men, respectively. The adjusted male black-white wage gap has expanded since 1979 for both new entrants (0 to 10 years of potential experience) and the more experienced (11 to 20 years), but the gaps in each year are always smaller among new entrants. The new-entrant wage gap started at 11.2 percent in 1979 and rose to an 18.7 percent disadvantage in 2015. On the other hand, more experienced black men started with a larger disadvantage of 19.5 percent and ended in 2015 with a 23.5 percent disadvantage. For new entrants, a large wage gap existed for men with no more than a high school diploma in 1980, and it expanded by 2014. Also troubling is the finding that black male college graduates (both those with just a college degree and those who have gone beyond college) started the 1980s with less than a 10 percent disadvantage relative to white male college graduates but by 2014 similarly educated new entrants were at a roughly 20 percent disadvantage. 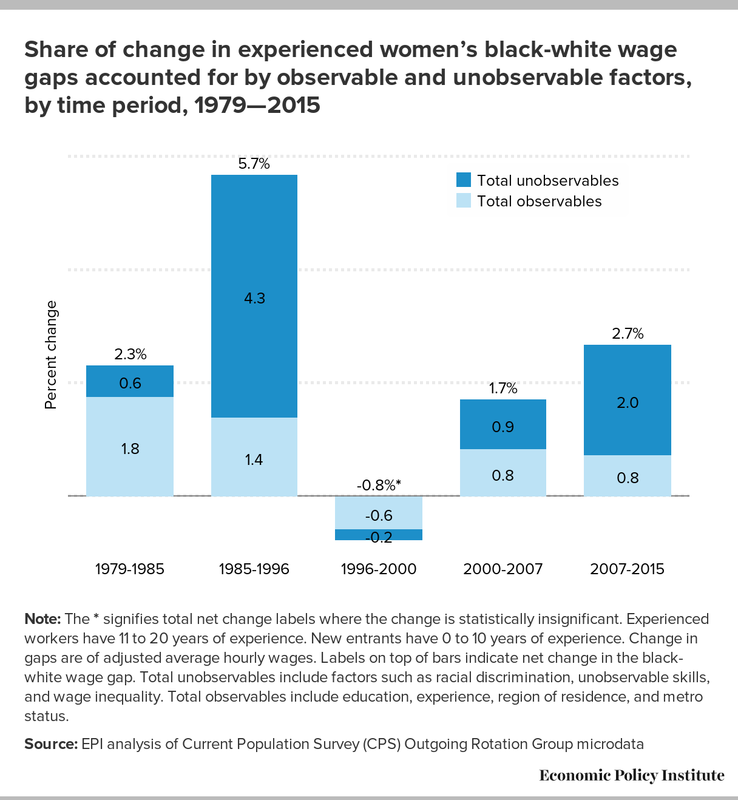 Despite the fact that black women in both experience categories were near parity in 1979, adjusted black-white wage gaps increased so sharply among more experienced women during the 1980s and early 1990s that experienced black women went from having smaller wage gaps than new entrants to having larger gaps. New-entrant women start with a black-white wage gap of 3.7 percent in 1979 and end at 10.8 percent in 2015. On the other hand, more experienced black women start at a 1.5 percent disadvantage that rises to 12.6 percent in 2015. All new-entrant women with a high school diploma or more start the 1980s with similar wage gaps (between 3.0 and 5.0 percent). Among more experienced black women, wage gaps are nearly nonexistent as the 1980s begin or, in the case of college graduates, actually favor black women. In both experience categories, however, the largest increases occur among college-educated women. Between 1979 and 1985, the main sources of expansion of black-white wage gaps among new-entrant men and women were a worsening in discrimination and/or growing differences in unobserved skills, and the decline in relatively good-paying jobs for workers with less than a college degree. Among new-entrant men, these effects far outweighed the positive effects from narrowing the education gap. Increased discrimination was the sole cause of growing racial wage gaps for college graduates during this period. Between 1979 and 1985, racial wage gaps widened most in the Midwest and among men working in the manufacturing industry. Shifting patterns of employment across industries and occupations also contributed to growing racial wage gaps among new-entrant men during this period. The narrowing of new-entrant racial wage gaps during the second half of the 1990s was largely due to a reduction in discrimination as labor markets tightened and public policy became more favorable for reducing racial wage inequality. Continued progress in narrowing education gaps between young black and white men also contributed to improvements during this period. Between the Great Recession of 2007–2009 and 2015, gaps among new-entrant women expanded more than among any other experience/gender group. The same factor that dominated prior to 2000—growing labor market discrimination—is the primary source of the erosion. Another major contributor has been the growing racial gap in college completion. While the effects of changing occupational patterns on trends in women’s racial wage gaps are minor in most periods, they have had the largest effect since 2000. Growing earnings inequality has impacted young black college-educated men’s and women’s wage deterioration more in the years since the Great Recession than during any other period. Black-white wage inequality among less-educated workers is becoming less of a regional issue but a greater problem for Americans overall. Since 1979, black-white wage gaps across regions have converged, but at higher levels of inequality. The deterioration of regional economies has been very bad news for less educated blacks. Inasmuch as they could move to better regions, at least from a wage standpoint, this is no longer possible, or as feasible. Racial wage gaps have grown most in the Midwest (where gaps were smallest in 1979) and least in the South (where gaps were largest in 1979). Declining unionization has had a role in the growing black-white wage gap, particularly for men newly joining the workforce. Between 1983 and 2015, the years for which data on union membership by race are available, the black-white wage gap grew 1.6 percent among new-entrant men and 3.0 percent among experienced men. The decline in unionization (membership and state union density) accounts for about one-fourth to one-fifth of this growth, regardless of experience. Among new-entrant men, a diminishing union wage premium (the percentage-higher wage earned by those covered by a collective bargaining contract) accounts for 43 percent of the total growth in the men’s racial wage gap; among experienced men it accounts for one-third. Our analysis of black-white wage gaps proceeds as follows. In Section 2, we place the black-white wage gap into the broader context of overall wage trends since 1979. Section 3 describes the literature on black-white wage inequality and the contributions of this study. Section 4 describes the data used in this analysis, and Section 5 describes broad trends and patterns in black-white wage inequality for men and women overall, as well as by potential experience and educational attainment. Section 6 breaks down these trends in a detailed analysis that includes regional and industry variations, the effects of declining unionization, and changing patterns of employment across industries and occupations. Section 7 concludes with an overview of the major themes and policy recommendations. Income inequality and slow growth in the living standards of low- and moderate-income Americans have become defining features of today’s economy, challenging the popular notion that with hard work anyone can get ahead in the United States. At the root of these economic challenges is the near stagnation of hourly wage growth for the vast majority of American workers over the last three-and-a-half decades. The salience of these issues is evidenced by the fact that terms like economic inequality, stagnant wages, and rebuilding the middle class are frequently used in national discourse on the state of the American economy, as well as by people in both political parties. The fingerprints of several policy decisions and business practices, including eroded labor standards, weakened labor market institutions, and excessive executive pay growth, can be found in the history of wage growth in the past generation (Bivens et al. 2014; Bivens and Mishel 2015; Mishel and Eisenbrey 2015). A key measure of the potential for pay increases is productivity growth, and since 1979 wages have grown more slowly than productivity for everyone except the top 5 percent of workers, while wage growth for the top 1 percent has significantly exceeded the rate of productivity growth. The disconnect between wage and productivity growth means that the majority of workers have reaped few of the economic rewards they helped to produce over the last 36 years because most of the benefits have gone to those at the very top of the wage scale. While this experience has not been limited to any single group of workers, African Americans have been disproportionately affected by the growing gap between pay and productivity. 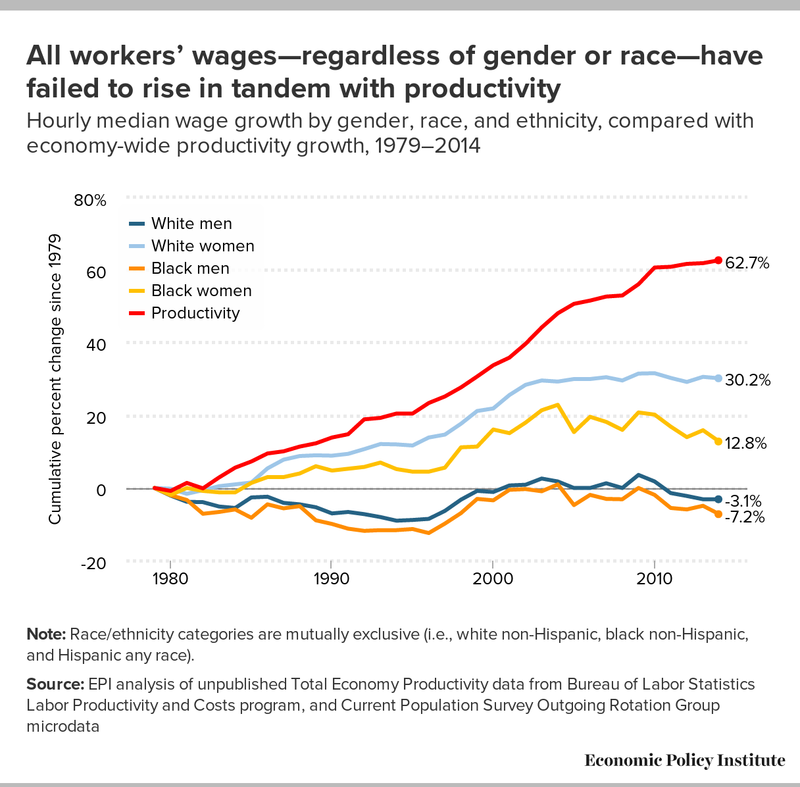 Figure A shows that since 1979 median hourly real wage growth has fallen short of productivity growth for all groups of workers, regardless of race or gender. At the same time, wages for African American men and women have grown more slowly than those of their white counterparts. As a result, pay disparities by race and ethnicity have remained unchanged or have expanded. Note: Race/ethnicity categories are mutually exclusive (i.e., white non-Hispanic, black non-Hispanic, and Hispanic any race). 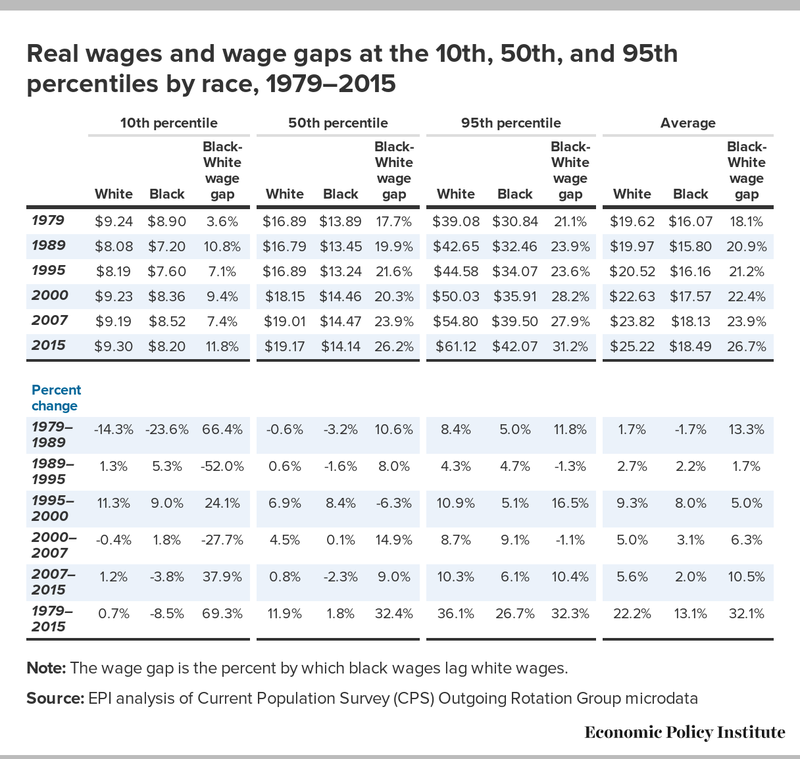 Table 1 further demonstrates the intersection of class and racial inequality, presenting trends in real wages and wage growth at the 10th, 50th, and 95th percentiles, as well as at the mean, of the wage distribution by race. We present these data for the business cycle peak years of 1979, 1989, 2000, and 2007, as well as for 1995 (the point during the 1990s business cycle after which wages grew dramatically) and for 2015 (the last year for which data are available). Note: The wage gap is the percent by which black wages lag white wages. One of the reasons that the average black-white wage gap has continued to expand is the fact that very few African Americans earn wages that place them among the top 5 percent of all wage earners, where most growth has been concentrated. Only 3 percent of all chief executives are African American, and a disproportionate number of them are employed in the public or private nonprofit sectors, where salaries are lower and more likely to be capped than they are in the private for-profit sector.1 In 2015, the hourly wages of the top 5 percent (95th percentile) of black earners was 31.2 percent less than the top 5 percent of white earners, corresponding to hourly wages of $42.07 for blacks and $61.12 for whites. These wage gaps are smaller among moderate earners, but they don’t go away completely. At the 50th percentile (median), blacks earn 26.2 percent less than whites, and at the 10th percentile blacks earn 11.8 percent less than whites. In addition to these racial differences in pay, Table 1 also makes clear that, over the last 36 years, strong wage growth has eluded most workers, regardless of race, and, to the extent that wages have grown at all, most of the growth happened in a single episode between 1995 and 2000. In almost every economic cycle preceding and following the late 1990s boom, wage growth of black and white low- to middle-wage earners was either flat or negative. Between 1979 and 2015, wages declined 8.5 percent for blacks in the 10th percentile and grew only 0.7 percent for whites. At the median, the wages of blacks grew a meager 1.8 percent, while those of whites grew only 11.9 percent. This compares with growth of 36.1 percent and 26.7 percent for 95th percentile whites and blacks, respectively. These patterns suggest that addressing the problems of stagnant wages and racial wage inequality has now become a dual imperative. While wage inequality is largely understood as a class issue, it is also important to understand how the stagnation of wages for the vast majority of all workers has contributed to measured racial wage inequality. At the same time, any effort to fully remedy racial wage gaps in a way that boosts wages and improves living standards for African American families must end the decades of broad-based wage stagnation that has had the most damaging effects on African American workers. This report focuses on trends in black-white wage gaps since 1979, including an analysis of the role that growing overall wage inequality has played. The literature on estimating and explaining black-white wage inequality has two distinct focuses. During the 1980s and 1990s, there was a great deal of attention to trend analysis and understanding of the causes behind the black-white wage gap’s three distinct periods of change: the gap’s dramatic narrowing from the late 1960s to the mid-1970s, the gap’s expansion during the 1980s, and its narrowing during the late 1990s (Bound and Freeman 1992; Juhn, Murphy, and Pierce 1991; W. Rodgers 2006).2 To our knowledge, little trend work has been done since, partly due to the perception that there has been little change from 2000 to the present. However, we will show otherwise. Researchers also focused on cross-sectional analysis in which they used the National Longitudinal Survey of Youth (NLSY) to assess whether the wage gap among a cohort of black and white men in their 20s and 30s was largely due to racial differences in cognitive skills that Current Population Survey (CPS) and Census-based trend analysis studies can’t control for.3 The NLSY contains a respondent’s Armed Forces Qualification Test (AFQT) score, which is introduced as a proxy for cognitive skills (Anderson and Shapiro 1996; Conrad 2001; Darity and Mason 1998; England, Christopher, and Reid 1999; Maxwell 1994; McCrate and Leete 1994; Neal and Johnson 1996; Neal 2004; O’Neill 1990; Rodgers and Spriggs 2001). This debate raged for several years, but seems to have quieted down. This study revisits the trend analysis that dominated the literature from the 1960s through the 1990s, and we update and extend previous studies by examining what has happened to the black-white wage gap since the late 1990s. Our analysis affirms that the black-white wage gap among men expanded during the 1980s and narrowed significantly during the 1990s. Our contribution is a detailed assessment of what has been the pattern or trend for men since the late 1990s and women since the late 1980s. What are the causes of the wage gap’s fluctuation? Events during the 1960s, including a narrowing in the educational attainment gap between blacks and whites (Carlson and Swartz 1988; Cunningham and Zaloker 1992; Zalokar 1990), the economic boom, and enforcement of anti-discrimination and affirmative action policy (Betsey 1994; Fosu 1992; Heckman and Payner 1989; Leonard 1990), have been cited as evidence for the gap’s narrowing. The contributors to the gap’s expansion in the 1970s and 1980s are numerous: erosion in anti-discrimination policy (Leonard 1990), growing general wage inequality (Blau and Beller 1992), deterioration in the manufacturing sector, and a decline in union representation (Bound and Freeman 1992). The economic boom from 1995 to 2001 is cited as a key contributor to the gap’s narrowing during the 1990s (Freeman and Rodgers 2000). For the latter period, some assert that higher black incarceration rates disproportionally pulled the less skilled out of the labor force, thus truncating the wage distribution at the low end and raising the average wage (Neal and Rick 2014). Although much has happened in the macroeconomy (e.g., a mild recession, sluggish economic growth, two jobless recoveries, and the Great Recession) since the 1990s boom, little work has been done to describe and explain the gap’s pattern or trends since 2000. Trends in educational attainment yield mixed messages as to the impact on the wage gap. Since 2000, college completion rates by black and white men have increased by 4.3 and 5.5 percentage points, respectively. 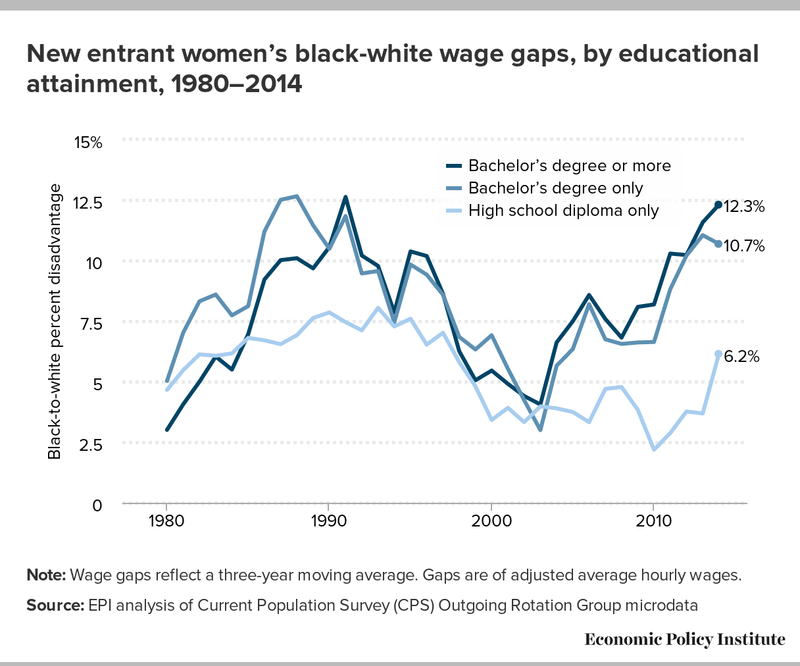 For black and white women, the increases were 7.3 and 10.6 percentage points.4 Thus, educational attainment will not contribute to any narrowing of either wage gap among college-educated blacks and whites. In fact, for educated women, patterns in the acquisition of a bachelor’s degree or more will contribute to an expansion in the college-educated racial gap. Patterns in imprisonment might put pressure on the wage gaps among the young and less educated to narrow, or at best remain the same. According to the U.S. Department of Justice, although the ratio of the imprisonment rate of white men and black men sat at 5.9 in 2014, it fell from 7.7 in 2000. The ratios among white women and black women fell from 6.0 in 2000 to 2.1 in 2014. For both, much of the drop was from 2000 to 2007 because the white imprisonment rate rose while the African American imprisonment rate fell. Because the ratio remains so large, imprisonment and its labor market scarring effects will definitely contribute to wage gaps in a given year, but their pattern over time since 2000 should assist in narrowing the wage gap. Changes in the macroeconomy will surely have an impact on the wage gaps since 2000. The U.S. economy experienced a mild eight-month recession from March to November 2001, but the jobless recovery that emerged in its aftermath was probably a more serious blow to the economy. Economic growth returned but it was not sustainable. From 2001 to 2007, the jobless rate was slow to fall, wages continued to stagnate, and household debt expanded to record levels. After the Great Recession of 2007–2009 job growth, instead of rebounding quickly as it did after the 1980s recession, took over 40 months to reemerge. Since February 2010, the economy has grown and private-sector job creation has spanned over 78 months. As of July 2016, the unemployment rate had fallen to 4.9 percent. However, it wasn’t until the end of 2015 that the jobless rate, which includes underemployment (workers who are marginally attached and working part time for economic reasons), fell back below 10 percent. Further, the labor force participation rate of prime-age adults has not returned to pre-recession levels. Unionization has historically provided a wage advantage to black workers, since union members receive higher wages than otherwise similar non-union workers and union membership rates are highest among black workers. Bound and Freeman (1992) documented the effect of declining unionization on wage losses among black men during the 1980s. Since then, the share of workers with union representation has continued to decline, falling 11 percentage points among blacks and 8 percentage points among whites between 1989 and 2015.6 We expect that this ongoing downward trend in overall union density and the convergence of membership rates among black and white workers has contributed to either flat or worsening racial wage gaps in the years since 2000. Historically, the relationship between macroeconomic growth and black-white inequality has been such that, as the economy expands, black-white inequality typically narrows, and, when the economy worsens, inequality expands. However, given the generally slower economic growth that has been the norm since 2000, what have been the patterns of black-white earnings inequality during the recovery of 2001–2007, the Great Recession of 2007–2009, and now the current recovery? We suspect that, after tremendous gains during the 1990s, since 2000 racial inequality has followed general patterns of inequality—either stagnated or expanded, but not in a dramatic style as during the 1980s. Collectively, tepid and unsustainable economic growth, plus the Great Recession, have led to expansion in the black-white wage gap. Much of the work on racial inequality has focused on the new-entrant wage gap because this demographic is most sensitive to macroeconomic and structural change. We divide the sample of workers into two experience categories—new entrants and more experienced workers—and perform a separate analysis for each group. We examine the more experienced workers because they were new entrants during the 1980s when the wage gap began expanding. Doing this allows us to see whether early labor market disadvantages persist over time.10 New entrants are defined as workers with 0 to 10 years of potential experience. For high school graduates, these are workers between the ages of 18 and 20; for those with a bachelor’s degree or higher, they are workers between the ages of 20 and 35. Experienced workers are those with 11 to 20 years of potential experience. High school graduates in this experience category are between the ages of 29 and 38. Experienced workers with a bachelor’s degree or higher are between the ages of 33 and 45. Figure B plots the trend in log hourly wage gaps (the percentage disadvantage) between black and white workers by gender since 1979. The graph includes four series, an adjusted and unadjusted series each for men and women. The unadjusted wage gaps are simply the average differences reported in the survey, while the adjusted series present wage gaps among full-time workers after controlling for racial differences in education, potential experience, region of residence, and metro status. Note: The adjusted wage gaps are for full-time workers and control for racial difference in education, potential experience, region of residence, and metro status. 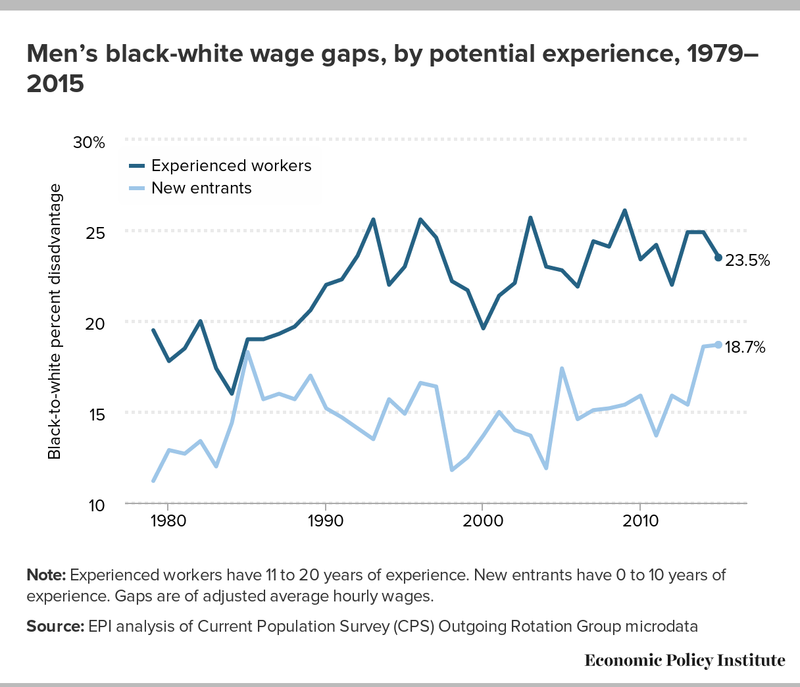 Looking first at the unadjusted series, we see the familiar pattern of expansion of black-white wage gaps during the 1980s. For men, this expansion occurred primarily in the first half of that decade, when unemployment was high and union density and the number of manufacturing jobs, especially in the Midwest, were drastically declining. As shown from the unadjusted men’s series in Figure B, black men’s average hourly wages were 22 percent lower than those of white men in 1979, and by 1985 the gap had grown to 27 percent. 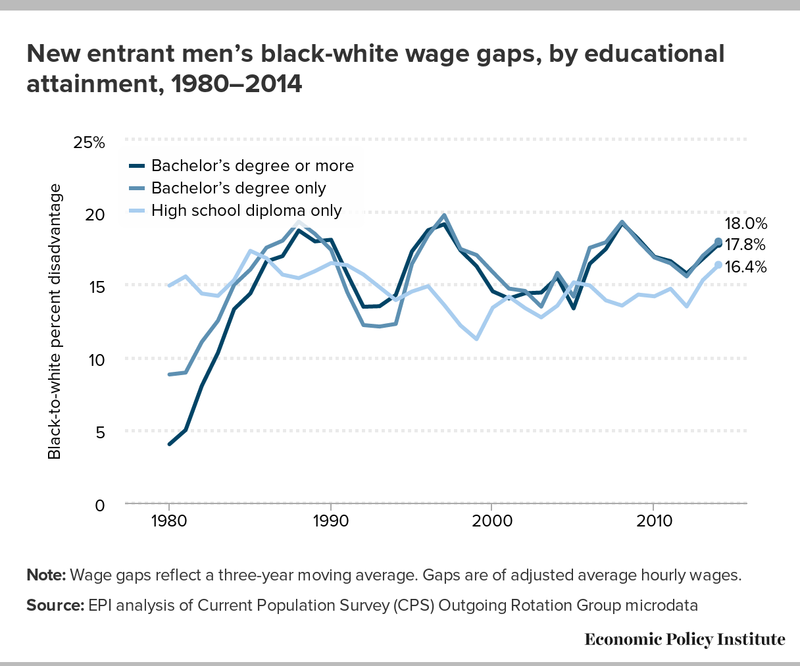 Men’s black-white wage gaps remained fairly stable from 1985 through much of the 2000s, gradually trending upward to 31 percent by 2015. For women, the expansion in the unadjusted black-white wage gap that began in the 1980s continued through the mid-1990s. This is notable because, with an average hourly wage gap of 6 percent, black women were near parity with white women in 1979. By 1985, this gap had grown to 8 percent, then nearly doubled to 15 percent by 1996. Since the mid-1990s, expansion of the women’s black-white wage gap has been more gradual, rising to 19 percent by 2015. While the adjusted and unadjusted series follow similar patterns, the adjusted estimates provide additional information that helps us to better understand these wage gaps. For example, part of the reason for the difference in average pay between white and black workers is that the composition of workers in each group is not the same. The difference between the adjusted and unadjusted series in Figure B shows how much of the average racial differences in pay (among full-time workers only) can be explained by racial differences in education, potential experience, region of the country, and metro status. For men, these differences reduce the estimated gap by roughly the same amount (5 to 8 percentage points) throughout most of the period we observe. For women, however, these characteristics go from having a very negligible effect on the gap in 1979 (1.5 percentage points difference) to reducing it by 7.3 percentage points by 2015. In other words, the wage gap’s growth was less pronounced between black and white women who have the same education, years of experience, metro status, full-time status, and region of residence. These results suggest that, while the impact of workforce composition on average black-white wage gaps among men has been fairly constant over time, the impact among women has increased as the characteristics of black and white working women have grown more distinct. An important thing to note here is that these adjusted series do not account for workforce composition factors such as racial and gender differences in incarceration. The adjusted estimates also help us to more clearly identify periods of wage convergence that are less obvious from observing trends in the average (unadjusted) gaps. The adjusted series for men and women in Figure B both show a brief period of progress toward racial pay equity between 1996 and 2000. During this period, the adjusted black-white wage gap falls from 23 percent to 20 percent among men and from 10 percent to 7 percent among women. During the late 1990s, macroeconomic growth was sustained and broad-based, and public policy became more favorable for reducing racial wage inequality. For example, the Bureau of Labor Statistics unemployment rate fell and remained below 5.0 percent from July 1997 to September 2001, and the federal minimum wage was increased in 1997 and 1998. Also, the number of states that set their minimum wage in excess of the federal minimum wage increased. The convergence of the wage gap during this period ended with the start of the short and shallow recession of 2001. Figure C shows adjusted hourly wage gaps for white and black women and black men relative to white men. Since black women were near parity with white women in 1979, their wage gap relative to white men was comparable. In 1979, for instance, white women were at a 37.8 percent disadvantage relative to white men, compared with a 42.3 percent disadvantage for black women relative to white men. Black women earned 25.4 percent less than black men in 1979, as measured by the difference between the lines for black women and black men (42.3 percent minus 16.9 percent). The gender wage gap narrowed considerably during the 1980s and early 1990s, resulting by 1993 in a gap of 23.1 percent (14.7 percentage points lower) for white women relative to white men, a gap of 30.9 percent (11.4 percentage points lower) for black women relative to white men, and a gap of 10.6 percent (14.8 percentage points lower) for black women relative to black men. These adjusted gender wage gaps have remained virtually unchanged since the 1990s, so the economic boom did not narrow gender wage disparities in the same way that it narrowed racial wage gaps. Davis and Gould (2015) estimate that 40 percent of the narrowing of the gender wage gap between 1979 and 2014 was due to falling wages for men. Note: The adjusted wage gaps are for full-time workers and control for racial differences in education, potential experience, region of residence, and metro status. Just as there are clear differences in the racial wage gaps by gender, young men and women face different wage gaps than older men and women. 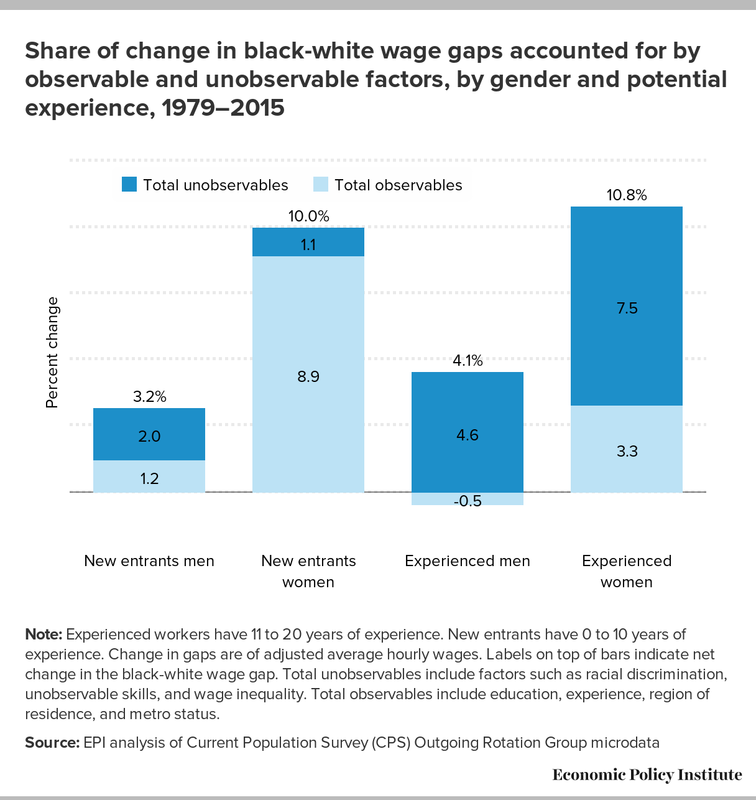 Figures D and E present estimates of adjusted men’s and women’s black-white wage gaps among new entrants (0 to 10 years of experience) and more experienced workers (11 to 20 years of experience).12 Figure D shows that the male black-white wage gap expands across both experience categories, but the gaps in each year are always smaller among new entrants, representing blacks and whites with the least potential experience. This pattern suggests that wage gaps grow larger as black men pursue their work lives. The new-entrant wage gap starts at 11.2 percent in 1979 and rises to an 18.7 percent disadvantage in 2015. On the other hand, more experienced black men start with a larger disadvantage of 19.5 percent and end in 2015 with a 23.5 percent disadvantage. The graph also shows that the early 1980s expansion of men’s black-white wage gaps occurred largely among new entrants, a finding that is consistent with the idea that younger, less-experienced workers are most sensitive to macroeconomic and structural change. 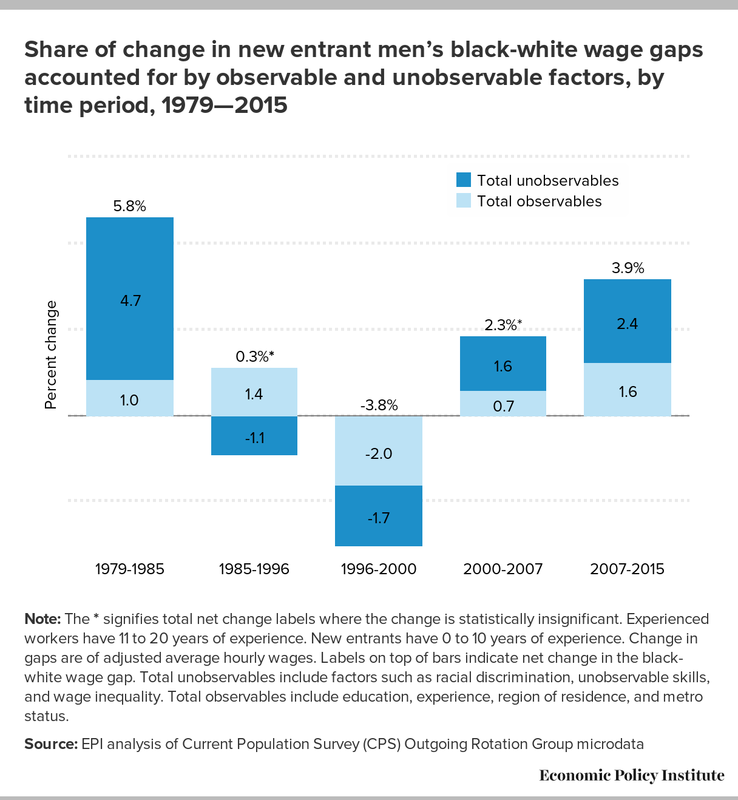 While the 1990s boom helped to reverse the relative wage deterioration of black men that occurred in the 1980s, those gaps have since reemerged. Note: Experienced workers have 11 to 20 years of experience. New entrants have 0 to 10 years of experience. Gaps are of adjusted average hourly wages. 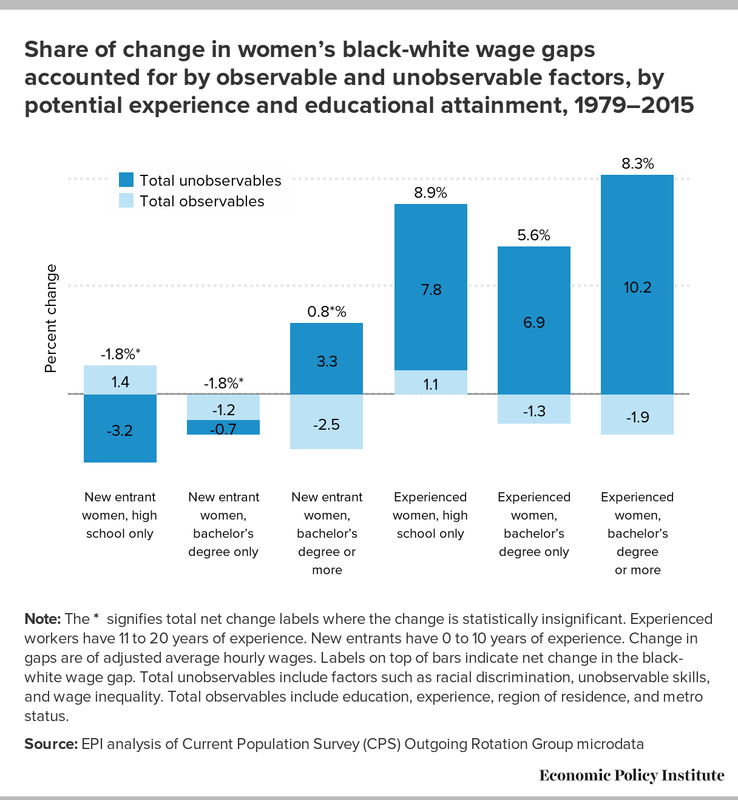 Comparable trends among women are shown in Figure E. Women’s black-white wage gaps increased so sharply among more experienced women during the 1980s and early 1990s that they went from having smaller wage gaps than new entrants to having larger gaps. New-entrant women start with a black-white wage gap of 3.7 percent in 1979 and end at 10.8 percent in 2015. On the other hand, more experienced black women start at a 1.5 percent disadvantage and rise to a 12.6 percent disadvantage in 2015. Similar to new-entrant men, the progress among new-entrant women between 1996 and 2000 reversed much of the damage of the 1980s, but since 2000 those gains have been erased. Next, we examine adjusted black-white wage gaps by educational attainment within each of the experience/age groups for men and women. This sorting allows us to see whether the deterioration in the wages of black men and women was uniform across educational attainment and experience levels, or was concentrated among particular groups. We plot these estimates as three-year moving averages in order to smooth out some of the volatility that results from cutting the data into smaller subsamples. While this process produces graphs that start at 1980 and end in 2014 (indicating the middle year of the three-year moving average), the trends revealed would essentially be the same if our graphs began at 1979 and ended in 2015 allowing us to fold the educational analysis in our broader discussion of the trend over the last three and a half decades. Figures F and G plot the estimates for new-entrant and experienced men, respectively. The summary point from Figure F is that in 1980 the men’s new-entrant wage gap was largest among those with only a high school diploma, but that group’s wage gap did not grow much further over the next 36 years. On the other hand, the wage gap among new-entrant men with a bachelor’s degree was smaller than that of high school graduates in 1980, but by the end of the period there was as much of a wage gap among the most educated as among any other group. The greatest growth seemed to be among those with more than a bachelor’s degree (as seen by the greater growth in the bachelor’s degree or more category than in the bachelor’s degree-only category). W. Rodgers (2006) documented this growth of the racial wage gap among the most educated workers, but few researchers and policymakers have paid attention to this finding that black male college graduates started the 1980s with less than a 10 percent disadvantage relative to white male college graduates and end with almost a 20 percent deficit in 2015. Note: Wage gaps reflect a three-year moving average. Gaps are of adjusted average hourly wages. Among more experienced black and white men, sizeable gaps existed at all levels of education in 1980, as shown in Figure G. While gaps among high school graduates changed little over the next three and a half decades, estimates among older college-educated men are more volatile, making it difficult to draw any clear conclusions. 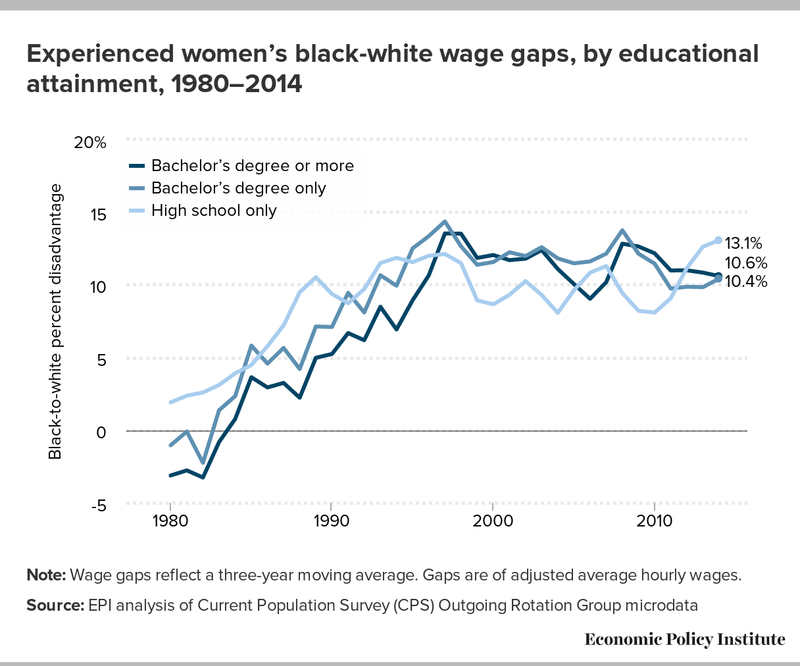 The progression of women’s black-white wage gaps by experience and educational attainment are distinct from those of men in some ways and similar in others. As shown in Figure H, all new-entrant women with a high school diploma or more start the 1980s with similar wage gaps (between 3 and 5 percent), while new-entrant men’s wage gaps vary more by attainment level. Among more experienced black and white women (Figure I), wage gaps were nearly nonexistent in 1980 or, in the case of college graduates, actually favored black women—also in sharp contrast to the large disparities among more experienced college-educated black men. As with men, the largest increase in the racial wage gaps, for both new entrants and more experienced workers, occurs among college-educated women, especially among those with more than a bachelor’s degree. This initial look at the general trends and patterns in racial wage gaps raises some key points that help to guide the remainder of our analysis. While black-white wage gaps for men and women are notably larger in 2015 than they were in 1979, this increase has not been consistent across time periods. Rather, there are three distinct periods of change: the 1980s, the 1990s, and post-2000. Most of the expansion of racial wage gaps occurred during the 1980s for men and during the 1980s through the mid-1990s for women. During the late 1990s, racial wage gaps narrowed. While this reversal helped to make up for much of the expansion of new-entrant gaps that occurred during the 1980s and early 1990s, it was less successful at reversing the trend among more experienced workers and college graduates. This is surprising given the relative strength of the 1990s boom, which suggests that, for more experienced workers, forces during the 1980s were more powerful than during the best economy since World War II. Over the last decade and a half, average black-white wage gaps among men and women have widened only slightly, even in the years surrounding the Great Recession. The exception to this pattern has been among new-entrant women, for whom racial wage gaps have grown more between 2007 and 2015 than in any other period included in our analysis. However, the absence of major changes in men’s black-white wage gaps during the seven years leading up to or following 2007 suggests that, since 2000, forces other than the Great Recession have disadvantaged African American men. Our trend analysis will precisely inform us as to the relative sizes of the erosion, improvement, and erosion again of black wages relative to those of whites over the distinct periods of change we have identified. Comparison of unadjusted and adjusted estimates reveals that racial differences in education, experience, region of residence, and metro status help to explain some of the average differences in pay between blacks and whites. For men, these differences have accounted for a fairly consistent amount of the gap, but for women these differences are responsible for more of the gap today than in 1979. 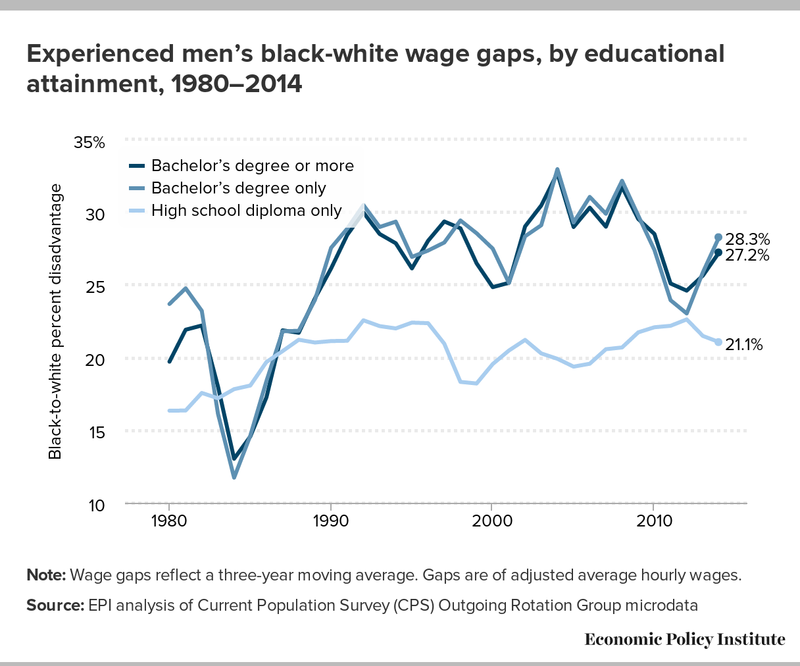 Over the 36-year period we examine, changes in adjusted black-white wage gaps also vary by potential experience and by education. Next we analyze the dynamics behind these changes and assign broad reasons for the overall patterns of change by gender and potential experience, as well as identify the interaction of potential experience with educational attainment and region of residence. This disaggregation is extremely important because it will further demonstrate the fact that there is no monolithic black experience. Economists have developed a useful tool for illustrating and describing the dynamics of how the black-white wage gap changes over time. Through a technique called wage decomposition, we can identify whether changes in the black-white wage gap are due to changes in “quantities” of various attributes of blacks and whites or the “prices” or economic returns to their attributes.13 These attributes may be things we can easily observe and measure in the data, like education and experience, or things we cannot directly observe or measure in the data. Such unmeasured characteristics can include racial wage discrimination, racial differences in unobserved or unmeasured skills, or racial differences in labor force attachment of less-skilled men due to incarceration. Juhn, Murphy, and Pierce (1991) offer a wage decomposition technique that allows us to decompose observable as well as unobservable attributes. The decomposition of unobservable attributes is based on the white residual wage distribution—the part of the white wage distribution that cannot be explained by observable factors—but it can be interpreted in a way that is analogous to the decomposition of observed attributes. Under this framework, quantities of unobserved attributes are represented as the percentile ranking of blacks in the white residual wage distribution. Prices of unobserved attributes are represented by white wage inequality as indicated by the variance of the white residual wage distribution. How much of the change in the wage gap comes from changes in racial differences in education, experience, region of residence, and metro status (observed quantities), holding the returns to these attributes (observed prices) fixed over time? For example, the wage gap may narrow across time because the educational attainment and experience of blacks relative to whites narrows. The wage gap may also narrow because blacks are advantaged by working in faster-growing regions or in metro areas instead of in rural areas. How much of the change in the wage gap comes from changes in the economic returns to education, experience, and working in a metro area or a particular region of the country (observed prices), holding racial differences in these attributes (observed quantities) fixed over time? For example, an increase over time in market returns to college graduates will cause the overall wage gap to expand since blacks on average are less likely to have college degrees. How much of the change in the wage gap is due to blacks moving up or down the white residual wage distribution (unobserved quantities), holding white wage inequality (unobserved prices) or the variance of the white residual wage distribution fixed over time? In simple terms, how have changing patterns of racial discrimination (or racial differences in unobserved or unmeasured characteristics) affected the wage gap? As an example, reduced racial wage discrimination could cause the ranking of the average black residual wage to rise from the 35th percentile to the 40th percentile of the white residual wage distribution, all else equal. How much of the change in the wage gap is due to changes in white wage inequality as measured by the stretching or contracting of the white residual wage distribution (unobserved prices), holding the position of the average black in the white residual wage distribution (unobserved quantities) fixed? In other words, how has the overall trend of growing wage inequality affected the wage gap? One can think of this as changes in the wage penalty for having a position below the mean of the white residual wage distribution. To remain consistent with prior studies by Juhn, Murphy, and Pierce (1991) and W. Rodgers (2006), the decompositions are performed for people who are at least 18 years old, employed in full-time jobs, and have 20 years of experience or less.14 Juhn, Murphy, and Pierce (1991) estimate these decompositions for black and white workers using the March CPS for 1979 to 1987, while W. Rodgers (2006) uses CPS-ORG files for 1979 to 1994. We use the CPS-ORG files from 1979 to 2015. Note: Experienced workers have 11 to 20 years of experience. New entrants have 0 to 10 years of experience. Change in gaps are of adjusted average hourly wages. Labels on top of bars indicate net change in the black-white wage gap. Total unobservables include factors such as racial discrimination, unobservable skills, and wage inequality. Total observables include education, experience, region of residence, and metro status. 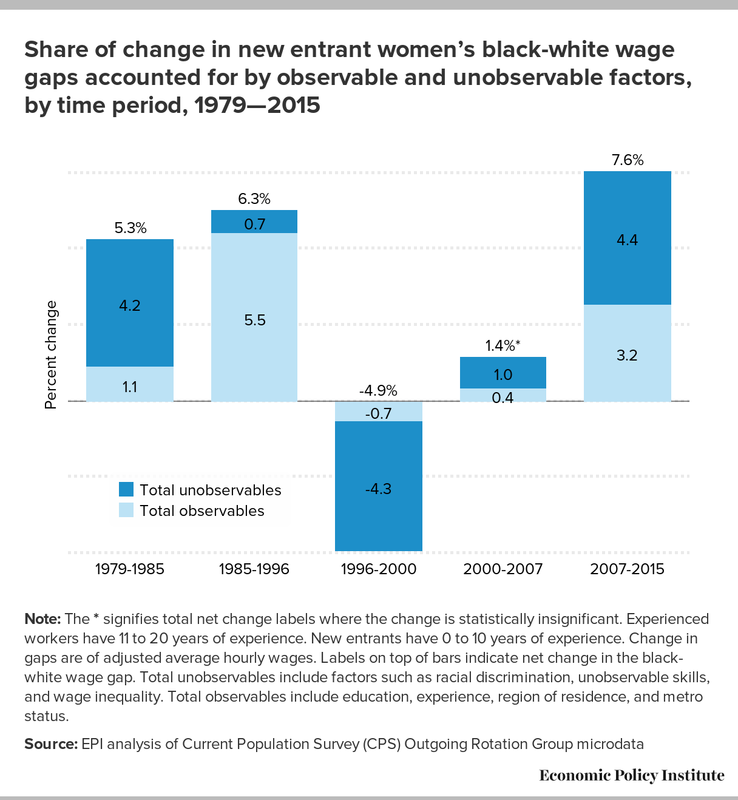 Figure J shows that the largest expansion of the wage gap since 1979 has occurred among African American women. This is especially troubling because black women also experience lower earnings associated with gender. The black-white wage gap for new-entrant women has grown 10.0 percent over the last 36 years, compared with 3.2 percent among new-entrant men. Over this same period, the wage gap among more experienced women has grown 10.8 percent, while the gap among more experienced men expanded 4.1 percent. Figure J also shows that, for both groups of men and for more experienced women, most of the expansion of wage gaps over that 36-year period has been due to unobservables—worsening discrimination and/or unobservable skills and growing overall wage inequality. For new-entrant women, growing racial gaps in observables—education, experience, region, and metro status—account for most of the expansion. We provide a more detailed discussion of how each of these components has affected wage gap trends in a later section, but first we describe these top-line decomposition patterns by educational attainment and over distinct periods of time. In Figures K and L, these decomposition results are further disaggregated by selected levels of educational attainment—high school graduates, bachelor’s degree only, and bachelor’s degree or more. These graphs show that some of the largest erosions of wages relative to whites are among blacks with the highest levels of educational attainment. For example, new-entrant and experienced African American male bachelor’s degree holders had losses of 4.9 and 5.1 percent between 1979 and 2015 (Figure K). Experienced black women with only a bachelor’s degree also lost ground as racial wage gaps grew by 5.6 percent among these older college-only women over the last 36 years (Figure L). Even worse, when we include African American men and women with advanced degrees (i.e., when we look at the category of workers who have a bachelor’s degree or more education), relative earnings fall by more. New-entrant college-educated African American women are the exception to this pattern. Racial wage gaps among young women with only a bachelor’s degree shrank by 1.8 percent, while wage gaps among young women with a bachelor’s degree or more education rose by less than 1 percent (0.8 percent)—changes that were not statistically different from zero. Note: The * signifies total net change labels where the change is statistically insignificant. Experienced workers have 11 to 20 years of experience. New entrants have 0 to 10 years of experience. Change in gaps are of adjusted average hourly wages. Labels on top of bars indicate net change in the black-white wage gap. Total unobservables include factors such as racial discrimination, unobservable skills, and wage inequality. Total observables include education, experience, region of residence, and metro status. Compared with college graduates, high school graduates generally experienced slower growth (experienced men) or narrowing in their gaps (new-entrant men and women). The exception was experienced black women with only a high school diploma, whose wages deteriorated 8.9 percent relative to their white female counterparts, more than the 8.3 percent deterioration among the most educated women in this experience category. Similar to what we observed among all workers, expansion of the wage gaps at each level of education was almost entirely due to unobservables—worsening discrimination and/or unobservable skills and perhaps also growing overall wage inequality. It may be tempting to view the improvement in relative wages among less-educated younger workers as positive, but it is well documented that mass incarceration may have pulled the least-skilled workers from the labor force and led to post-incarceration scars, which means that African American men and women disproportionately have ex-offender status that precludes them from certain jobs and/or makes it harder for them to convince an employer to hire them. If they do get employed, they are paid at lower rates. This disproportionate exit from the labor force and larger wage penalties improves the relative skill composition of less-educated blacks in the labor force (Holzer 2004; Neal and Rick 2014). This sample selection truncates the black wage distribution from below, thus raising the average wage of African Americans. If this occurred, it would explain why the new-entrant high school wage gaps did not expand. Comparing Figures M through P, we see that, regardless of demographic characteristics (e.g., gender and potential experience), black-white wage gaps expanded during the 1980s and early 1990s and narrowed from 1996 to 2000, although gaps among women expanded much more than gaps among men between 1985 and 1996. This suggests an important conclusion: that rising unemployment, like we saw during the early 1980s, increases the black-white wage gap while falling unemployment, like we saw during the late 1990s, shrinks it. While economic growth and unemployment improved during the second half of the 1980s, the effect on black-white wage gaps was limited by the fact that policies like failure to raise the minimum wage and lax enforcement of anti-discrimination laws were less conducive to closing these gaps. In each period, new-entrant blacks faced the greatest fluctuations or swings in their relative earnings. This is to be expected, as they have the least skills and experience that typically insulate an individual from changes in the macroeconomy. Unobservable factors contributed to more of the change among new entrants in both of these periods, while observable factors explain more of the growing gaps among experienced workers. Between 2000 and 2007, black-white wage gaps quietly trended upward, but, after 2007, the patterns are much less discernable such that a consistent explanation emerges. Again, worsening discrimination and/or unobservable skills and overall wage inequality have been the main causes of growing wage gaps since 2000. We now describe our decomposition results in greater detail. Table 2 presents these results for new entrants by gender and educational attainment for each of the subperiods as well as the entire 36-year period from 1979 to 2015. The first row in Table 2 presents the total percent change in the wage gap over each period of time. The rows labeled total observable and total unobservable sum to the total percent change in the wage gap. Under each of these rows, the respective quantity and price contributions sum to the total observable and total unobservable components. The observable attributes are further disaggregated into contributions from each characteristic that sum to their respective quantity and price totals. Negative numbers indicate a shrinking gap, while positive numbers indicate a growing gap. Note: Total unobservables include factors such as racial discrimination, unobservable skills, and wage inequality. Total observables include education, experience, region of residence, and metro status. Change in gaps are of adjusted average hourly wages. From 1979 to 1985, new-entrant African American men and women saw their relative earnings fall by 5.8 percent and 5.3 percent, respectively. For young black men, those six years were the period of the most rapid relative wage deterioration. Similar to the results for the full 36-year period, the loss in relative earnings was largest among black college graduates. The losses for black male and black female high school graduates were 5.0 and 3.2 percent, respectively, compared with losses of 7.7 and 6.6 percent for bachelor’s degree holders and 12.5 and 6.6 percent for new entrants with bachelor’s degrees or more education. The main source of the expansion among new-entrant men and women during the 1979–1985 period was a worsening in discrimination and/or unobservable skills of blacks. For example, some cite the erosion in affirmative action and anti-discrimination laws during this period that lessened pressure on employers to maintain fair workplaces. This downward movement of blacks in the white wage distribution accounted for nearly two-thirds of the gap’s expansion among new-entrant men (3.7 points of the total 5.8 percent) and three-fourths of the expansion among new-entrant women (3.9 points of the total 5.3 percent).16 Among black college graduates, growing discrimination was essentially the sole cause of the gap’s expansion, far outweighing the advantages black college graduates gained as a result of being slightly older (i.e., more experienced) than their white counterparts. Another factor driving the expansion of racial wage gaps during this period was the decline in relatively good-paying jobs for workers with less than a college degree, as measured by the contribution of education prices among all new entrants. Declining pay among workers without a college degree accounted for half of the gap’s expansion among new-entrant men during this period (2.9 points of the total 5.8 percent) and one-fifth of the decline (1.1 points of the total 5.3 percent) among new-entrant women. Among all new-entrant men, the effect of this change was so large that it completely overshadowed improvements in the racial wage gap resulting from young black men’s progress toward narrowing the education gap (-1.8 percent). Most young African American workers experienced a reversal of fortune in the 1990s. From 1996 to 2000, the relative earnings of new-entrant black men and women narrowed by 3.8 and 4.9 percent, respectively. All wage gaps among the various education sub-groups that we analyze narrowed as well. The narrowing of the new-entrant gaps during the second half of the 1990s tends to be due to a reduction in discrimination and/or unobservable skills between blacks and whites—the opposite of what occurred during the 1979–1985 period. This reduction accounted for 60 percent (-2.3 points of the total -3.8 percent) and 90 percent (-4.4 points of the total -4.9 percent) of the gap’s narrowing among new-entrant men and women, respectively.17 Continued progress in narrowing the observed education gaps between young black and white men also contributed to the narrowing of the gap among new-entrant men during this period. From 2000 to 2007, the gaps among new-entrant men expanded by 2.3 percent, while the gaps among new-entrant women expanded by 1.4 percent. For both groups, these increases are statistically insignificant, but larger and more precisely measured increases emerged between 2007 and 2015. Since the Great Recession’s start in 2007, gaps among new-entrant women have expanded more than for any other group (7.6 percent), while gaps among new-entrant men have grown at almost half that rate (4.0 percent). The same factors that dominated prior to 2000 continue to generate the expansion and narrowing in the wage gaps. A worsening in the unobservable skills and attributes or an increase in labor market discrimination is the primary source of the erosion. From 2007 to 2015, the discrimination and/or unobservable skills term accounts for one-third of the expansion (1.3 points of the total 4.0 percent) among new-entrant men and 45 percent (3.4 points of the total 7.6 percent) of the expansion among new-entrant women.18 Another major contributor to widening new-entrant wage gaps since the Great Recession has been the growing educational differences arising from smaller increases in black college completion. It is also worth noting that inequality has impacted young black men’s and women’s wage deterioration more in the years since the Great Recession than during any other period. Growing earnings inequality disadvantages all lower-wage and/or less-skilled workers but particularly African American workers, because the black wage earner tends to be located in the lower tail of the white wage distribution. Interestingly, the effect of growing earnings inequality has been greatest among African American new-entrant college graduates and advanced-degree holders, accounting for 65 percent (1.6 points of the total 2.4 percent) of the expansion among men and 22 percent (1.5 points of the total 6.8 percent) among women. Shifting to experienced workers, Table 3 presents decomposition results by gender and educational attainment for each of the sub-periods as well as the entire 36-year period from 1979 to 2015. We find a pattern similar to new entrants, but the size of the wage gap’s expansion during the 1980s, its narrowing during the 1990s, and expansion since 2000 are smaller. Between 1979 and 1985, the average wage gaps of experienced workers expanded, ranging from 2.3 percent for women to 2.6 percent for men—half the size of the gap’s growth among new entrants. Although losses were greatest for college graduates in this experience category as well, their wage gaps expanded by less than those of college-educated new entrants. Growing wage inequality during the 1980s had a notably large impact on the relative wages of more experienced African American men, accounting for 81 percent of the gap’s expansion among all experienced men and as much as 96 percent among high school graduates. Similar to the results for new entrants, the other major contributor to widening wage gaps among more experienced workers was the decline in relatively good-paying jobs for workers with less than a college degree, as measured by the contribution of education prices. This effect was 52 percent of the total increase among all experienced women (1.2 points out of the total 2.3 percent), but among all experienced men it totally wiped out gains resulting from increased educational attainment and reduced discrimination and/or unobservable skills. Note: Total unobservables include factors such as racial discrimination, unobservable skills, and wage inequality. Total observables include education, experience, region of residence and metro status. Change in gaps are of adjusted average hourly wages. During the 1990s, some narrowing in the average wage gap occurs, but it is less pronounced than in the expansion of the 1980s, especially among women. Among all experienced women, racial wage gaps closed by less than 1.0 percent between 1996 and 2000. 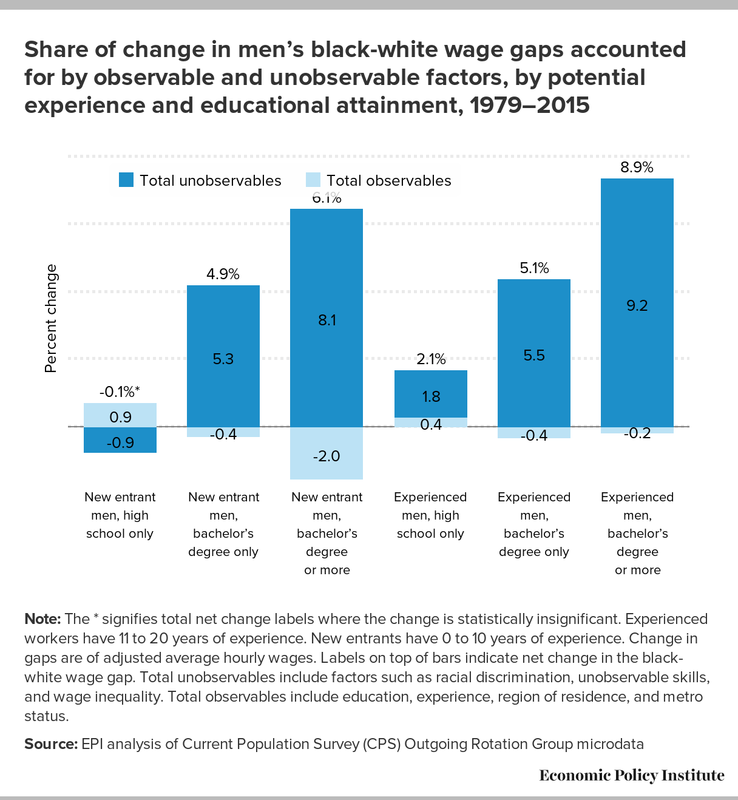 The corresponding change among all experienced men was a 1.8 percent improvement, and its primary source was reduced discrimination and/or unobservable skills, particularly for black men with a bachelor’s degree or higher. Among experienced women, the greatest improvements were among high school graduates (1.9 percent), with reduced discrimination and/or unobservable skills accounting for most of the narrowing here as well. Finally, the period since 2000 is also suggestive of a worsening in African American progress for experienced men and women without a college degree. Experienced men with only a high school diploma saw their relative wages deteriorate more in the years leading up to the Great Recession (3 percent between 2000 and 2007), while for women in this category most of the deterioration has happened since the Great Recession (3.6 percent between 2007 and 2015). Since 2000, wage gaps among experienced college graduates are characterized by modest increases or stagnation. Discrimination and/or unobservable skills play a larger role for men than women during this period. Next, we examine whether less educated African Americans living in certain regions of the country or in metro areas were more adversely impacted by changes in the wage gap. Differences in regional economies and labor market institutions have a lot to do with variations in wage gap trends in different parts of the country. Our results reveal that the Midwest and the South represent opposite ends of the pole with respect to expansion of the black-white wage gap among high school graduates. In other words, racial wage gaps have increased most in the Midwest and least in the South. 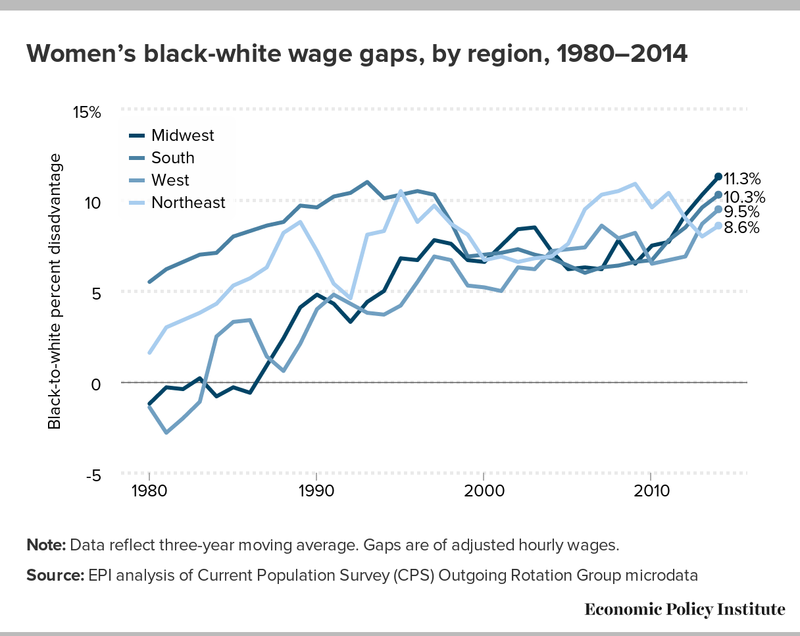 The significance of this trend is further emphasized by the fact that in 1979 the Midwest had the smallest black-white wage gaps and the South had the largest. These two regions were home to over three-fourths of African American workers in 2015, with 58.3 percent residing in the South. The South and Midwest also have distinct regional economies and labor market institutions. 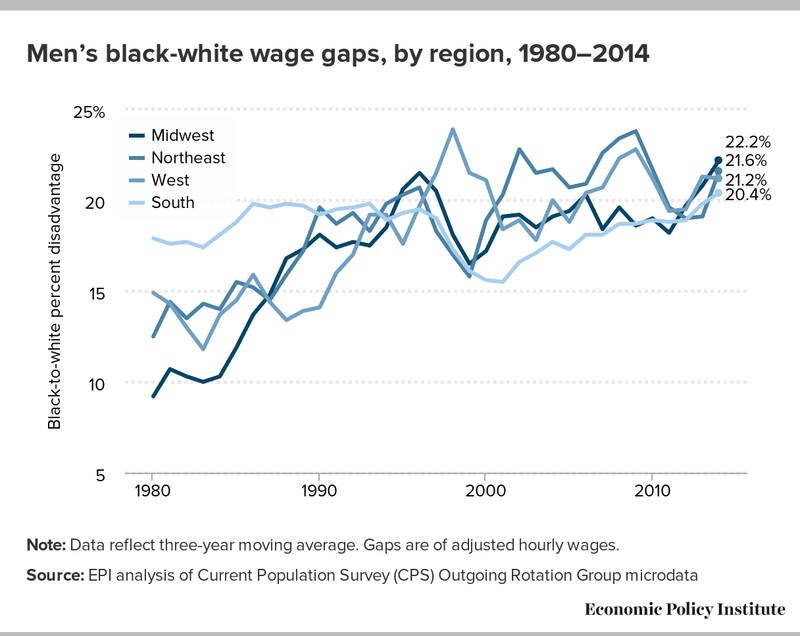 Therefore, understanding how these dynamics have influenced racial wage gap trends in the Midwest and South is critical to understanding the national picture. Figures Q and R, which show three-year moving averages of black-white wage gap trends by region for men and women, respectively, illustrate that racial wage gaps were clearly larger in the South than other regions of the country throughout most of the 1980s, but, since then, wage gaps in other regions of the country have risen to levels more consistent with the long-term pattern of the South. This convergence is largely due to the rapid expansion of black-white wage gaps in non-Southern states throughout the 1980s and 1990s. Still, there are notable differences in the experiences of black men and women in the South. Men’s black-white wage gaps in the South remained relatively unchanged from the mid-1980s to the mid-1990s (Figure Q), while women’s wage gaps expanded (Figure R). Both men’s and women’s black-white wage gaps declined sharply during the late 1990s through about 2000. Since 2001, wage gaps in the South have risen to levels near to those seen before the late 1990s economic boom. Regional specific factors such as collective bargaining and manufacturing that once helped less educated African Americans no longer protect them. Note: Data reflect three-year moving average. Gaps are of adjusted hourly wages. Minimum-wage laws, which vary by state and region, also have a disproportionate effect on black workers because they are overrepresented in low-wage jobs. We do not explicitly test the impact of these policies in this analysis, but note some of the facts that may be influencing observed trends in the data. Prior to 2007, few Southern or Midwestern states set a minimum wage above the federal minimum, and few states in any region of the country raised the state minimum wage independent of increases in the federal minimum wage. After a small increase in 1981, the federal minimum wage and most state minimum wages remained unchanged until the end of the decade. This likely contributes to the common trend of growing racial wage gaps across all regions during that period of time. The federal minimum wage was increased in 1991 and 1992 and then again in 1997 and 1998. Along with strong economic growth and an extended period of low unemployment, these policy changes are consistent with the timing of narrowing of racial wage gaps in all regions during the late 1990s. Since 2000, there has been increased variation in minimum-wage policy across states and localities as racial wage gaps across the country have continued to grow, but at a slower pace than they did during the 1980s. Currently, 29 states and the District of Columbia have a minimum wage higher than the federal minimum wage, and 29 localities have adopted minimum wages above their state minimum wage (EPI Minimum Wage Tracker, 2016). Most of these changes have taken place in non-Southern states. Next, we turn to the effects of regional macroeconomic trends. Bound and Freeman (1992) found that less-educated African Americans in the Midwest were hurt the most during the 1980s mostly because of the loss of manufacturing jobs, which also coincided with declining unionization. We examine whether these losses have continued, or if government assistance during the Great Recession and recovery have helped to reduce inequality in the Midwest. On the other hand, the South was viewed as a rapidly growing economy during the 1990s, with cities like Atlanta or the research triangle in Raleigh-Durham, NC, providing greater opportunity for African Americans. We explore this hypothesis and look at what has happened to racial wage gaps in the South during the 2000s. In order to test these theories about how wage gap trends are related to variations in regional economies, we focus on high school graduates who, as less-skilled workers, are most susceptible to regional fluctuations in the economy. Tables 4 and 5 present decomposition results for new-entrant and experienced high school graduates in the four major U.S. Census regions: Northeast, Midwest, South, and West. These findings are consistent with Bound’s and Freeman’s (1992) documentation of deteriorating earnings among young less-educated black men during the 1980s as manufacturing jobs and unionization declined, but they also show significant expansion of wage gaps since 2000. Table 4 shows that between 1979 and 1985 the black-white wage gap among male new entrants in the Midwest grew by 13.1 percent. As jobs opportunities dried up during this period, discrimination was a major factor in the suppression of young black men’s wages, accounting for 63 percent of the racial wage gap’s expansion (8.2 points out of the total 13.1 percent). The second largest period of expansion was 2000–2007, when the gaps grew 8.2 percent. There is also evidence that this disadvantage among men who were new entrants in the early 1980s carried over into later years of men’s working lives. The experienced men’s racial wage gap grew 19.2 percent between 1979 and 2015 (Table 5), with most of the gap’s expansion occurring between 1985 and 1996 as more of the early 1980s cohort of new entrants were aging into the more experienced category. Note: Total unobservables include factors such as racial discrimination, unobservable skills, and wage inequality. Total observables include education, experience, region of residence, and metro status. New entrants have 0 to 10 years of experience. Note: Total unobservables include factors such as racial discrimination, unobservable skills, and wage inequality. Total observables include education, experience, region of residence, and metro status. Experienced workers have 11 to 20 years of experience. Our findings also show that wage deterioration of black high school graduates in the Midwest was not limited to young black males but also included experienced black women. As shown in Table 5, between 1985 and 1996 racial wage gaps widened 12.8 percent among more experienced women in this region. The second largest period of growth has been during the years since the Great Recession: gaps expanded 8.6 percent between 2007 and 2015. During both periods, worsening discrimination and/or increasing unobservable skills account for nearly all of the relative wage deterioration of experienced black women in the Midwest. Tables 4 and 5 also support the trends shown in Figures Q and R, indicating big improvements in black-white earnings inequality among all groups in the South during the late 1990s economic boom. In fact, Southern new-entrant men’s wage gaps declined during the late 1990s, despite upward pressure on wage gaps exerted by overall wage inequality, more so than in any other region of the country (Table 4). Table 4 further indicates that the largest gains for Southern workers were among new-entrant black women. Between 1996 and 2000, the new-entrant wage gap among women with only a high school diploma closed 8.1 percent—the largest gain of all the groups in any region of the country. While reduced discrimination and/or improvements in unobservable skills were by far the largest factors in this improvement, the decomposition results also suggest young black women were drawn to faster-growing areas of the South. Division and metro (quantities) account for 15 percent of the improvement in relative wages of new-entrant black women with only a high school education (1.2 points out of the total 8.1 percent). The Bureau of Labor Statistics began publishing metro area unemployment rates in 1990, and we use these local rates to further examine the impact of differences in local economic conditions on wage gaps. For the subset of metro areas for which unemployment rates are available, we found that differences in metro area unemployment rates explain little of the changes in wage gaps since 1990.20 Adding this variable has a negligible effect on the decomposition results, suggesting no improvement in the distribution of black workers across metro areas and no growing wage-curve advantage over time. In other words, on average black workers haven’t relocated to metro areas with lower unemployment rates, nor have relative differences in unemployment rates across metro areas changed much since 1990. The erosion of collective bargaining is another factor that has caused wages to decline, especially among middle-wage workers and workers in the Midwest. On average, the hourly wages of union members are 13.6 percent higher than those of otherwise similar workers (Mishel 2012). For African Americans, this union wage premium is even greater—17.3 percent. However, as the share of workers represented by a union contract has declined, fewer workers—both union and non-union—have been able to reap the benefits of collective bargaining. 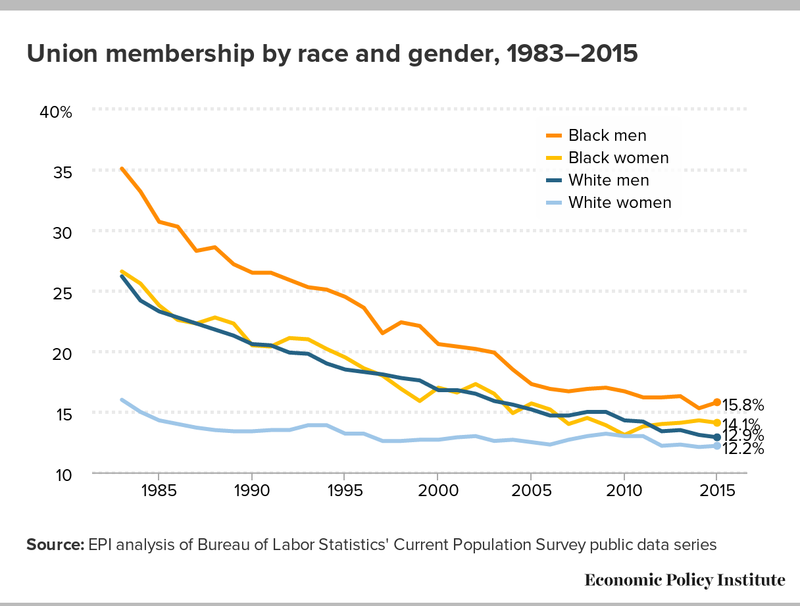 As shown in Figure S, although African American men and women remain more likely to be union members than their white counterparts, rates of union membership have declined more sharply among blacks since 1983, the earliest year for which we have union membership data by race. At the same time, union density, or the percentage of people within a state who are represented by a union, has also been declining. 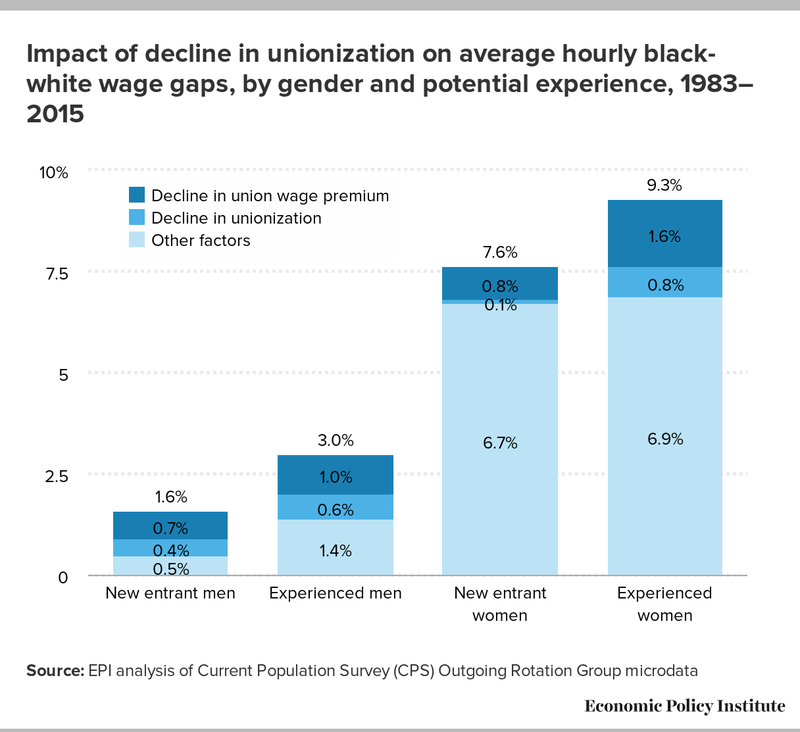 Figure T shows how the decline in unionization has impacted black-white wage gaps since 1983. Between 1983 and 2015, the years for which data on union membership by race are available, the black-white wage gap grew 1.6 percent among new-entrant men and 3.0 percent among experienced men. The decline in unionization (membership and state union density) accounts for about one-fifth of this growth, regardless of experience. A diminishing union wage premium (the percentage-higher wage earned by those covered by a collective bargaining contract) accounts for 43 percent of the total growth in the men’s racial wage gap among new-entrant men and one-third of the gap’s expansion among experienced men. 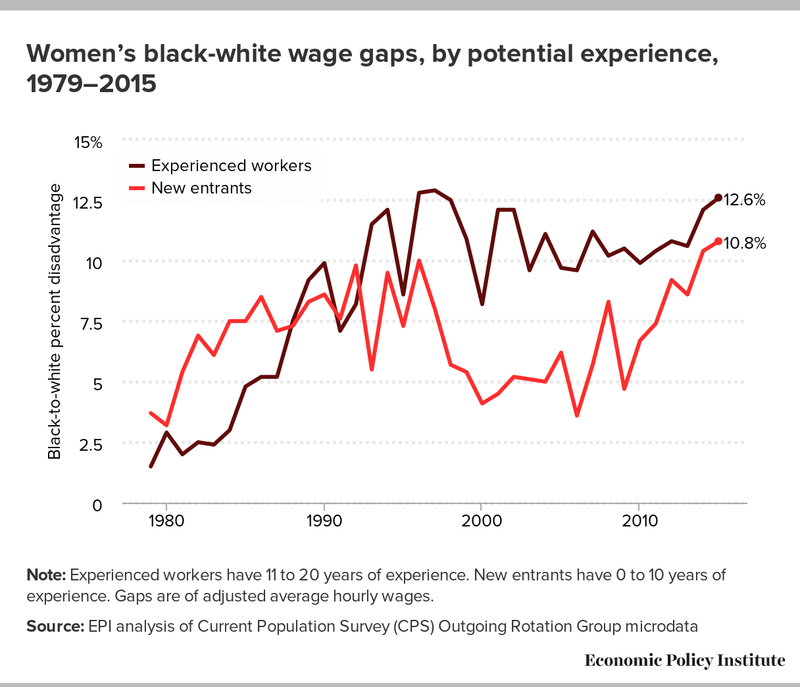 Racial wage gaps among women expanded by much more between 1983 and 2015, growing 7.6 percent among new entrants and 9.3 percent among experienced women. Declining unionization accounts for less than one-tenth of the growth in the racial wage gap among women—1.3 percent for new entrants and 8.6 percent for experienced workers. A diminishing union wage premium accounts for 10.5 percent of the total growth in the women’s racial wage gap among new-entrant women and 17.2 percent of the gap’s expansion among experienced women. The proportionately larger effect of deunionization on the wages of new-entrant black men and more experienced black women is also consistent with large wage losses for these groups in the Midwest. African American union membership in the Midwest declined 64.3 percent between 1983 and 2015, compared with a decline of 53.8 percent among whites in the region. The results of our decompositions with the addition of union density and union membership variables are available in the appendix. Next, we compare black-white wage gap trends in selected industries that are highly segregated by gender. For men, we focus on the manufacturing and construction industries (Table 6). The manufacturing industry accounted for 34 percent of men’s employment in 1979 but only 17 percent by 2015. Men’s employment in the construction industry has remained more stable at 9 percent over this time. For women, we focus on the education and health industries (Table 7). The share of women employed in these industries has increased from 30 percent in 1979 to 41 percent in 2015. Note: Total unobservables include factors such as racial discrimination, unobservable skills, and wage inequality. Total observables include education, experience, region of residence, and metro status. As shown in Table 6, since 1979 black-white wage gaps have narrowed among men in the construction industry, with new-entrant racial wage gaps improving 10 percent between 1979 and 2015. That improvement has been the combined result of the education levels of black and white men in the construction industry becoming more similar over time, and the fact that these men are less segregated across regions and metro areas. Within the last eight years, reduced discrimination and/or increasing unobservable skills have also played more of a role in narrowing wage gaps. While the deterioration of relative earnings of new-entrant black men within the manufacturing industry was similar to what was observed nationally between 1979 and 2015, there was a much larger decline in manufacturing during the 1980s. Between 1979 and 1985, new-entrant racial wage gaps in the manufacturing industry grew 11.4 percent, compared with 5.8 percent nationally. During this period, returns to education account for almost 30 percent of the gap’s expansion among new-entrant men (3.3 points out of the total 11.4 percent), suggesting that a significant part of the expansion was related to black men becoming more concentrated in lower-paying jobs within the manufacturing industry. Among more experienced workers in the manufacturing industry, these same factors account for 36 percent of relative wage deterioration (2.1 points out of the total 5.8 percent). Worsening discrimination and/or increasing unobserved skills accounted for half of the growth in racial wage gaps among new entrants, while growing overall wage inequality accounted for 41 percent of the growth among more experienced men (2.4 points out of the total 5.8 percent). On the other hand, new-entrant black men made considerable wage gains in the manufacturing industry between 1996 and 2000, benefiting from increased education and experience (age). But over the entire period from 1979 to 2015, more experienced black men in the manufacturing industry lost ground in spite of narrowing education gaps. Growing overall wage inequality and increased representation in lower-paying jobs in the industry outweighed the impact of increased education nearly 2-to-1. The wage gap expanded less for new-entrant women in the education and health industries than in the broader workforce, but for more experienced black women in these industries the magnitude of the expansion was similar to that in the overall workforce. Growing overall inequality and widening differences in the returns to education are the primary reasons for the expansion among new-entrant women. For more experienced women, widening differences in the returns to education and increased discrimination were the largest factors. Patterns of expansion and improvement over different periods of time mirror those observed in the larger samples. The above analysis shows how wage gaps changed within major industry sectors. Next, we examine how much of the change in racial wage gaps can be explained by changing patterns of employment across sectors and occupations based on the percent of blacks employed in each industry and occupation each year. Industry and occupation classification codes changed several times over the course of our data series, making it difficult to produce comparable estimates over the entire 1979–2015 period. As a way of working around this inconsistency in the data, we proceed by using broad single-digit industry and occupation codes to produce one set of estimates for the years 1979–1999 based on older codes and another set of estimates for the years 2000–2015 based on the new codes. 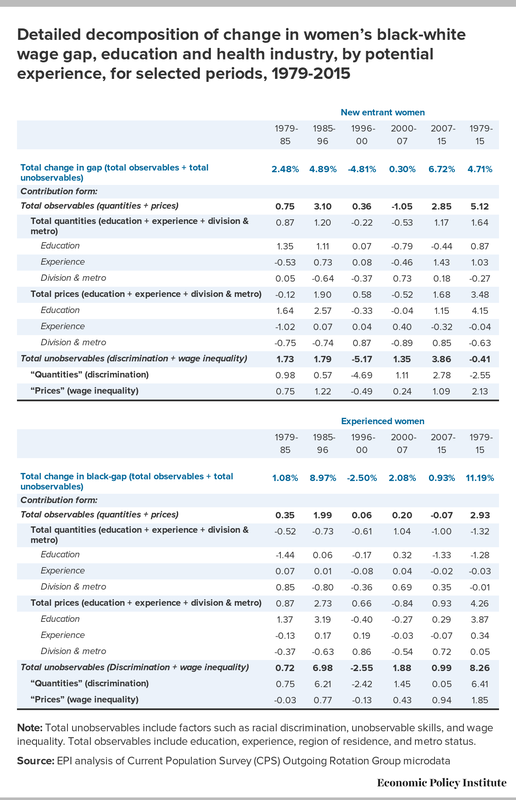 While the broad, single-digit industry and occupation categories may be picking up less of the changing racial composition and wage structure of occupations than more detailed three-digit categories, they still allow us to identify periods of time when the impact of these changes has been most significant.21 For example, changing employment patterns had the largest effect on men’s black-white wage gaps during the years 1979–1985. The employment of black men in more racially segregated jobs accounted for 28.6 percent (a combined 1.6 points from industry and occupation quantities out of the total 5.6 percent) of the growth in black-white wage gaps among new entrants and 41.2 percent among more experienced workers (1.2 points out of the total 2.5 percent). This finding is consistent with Blau and Beller (1992), who report that “adverse occupational shifts” increased the black-white wage gap for men during the 1980s. While the effects of changing patterns of employment on black-white wage gaps among women are minor in most periods, changing occupational patterns have had the largest effect in more recent years. Between 2000 and 2015, the employment of black women in more racially segregated jobs accounts for 11.4 percent of the gap’s expansion among new entrants (1.2 points out of the total 10.4 percent) and 24.9 percent among more experienced workers (1.2 points out of the total 4.7 percent). Otherwise, controlling for changing patterns of employment across industries and occupations offers little additional explanation for the growth and narrowing of racial wage gaps over time. Rather, discrimination and/or unobservable skills remain predominantly responsible for changes in racial wage gaps, especially during periods of time when the gaps changed most. The results of our decompositions with the addition of industry and occupation variables are available in the appendix. This study revisits the trend and decomposition analyses that dominated the literature from the 1960s through the 1990s. We update and extend previous studies by examining what has happened to the black-white wage gap since the late 1990s. While black-white wage gaps are larger today than they were in 1979, we identify three distinct periods of change. The gaps expanded during the 1980s and narrowed significantly during the late 1990s, both among men and women. Since 2001, wage gaps among men and women have widened only slightly, even in the years surrounding the Great Recession. The exception to this pattern has been among new-entrant women, for whom racial wage gaps have grown more between 2007 and 2015 than in any other period included in our analysis. The magnitude of these changes varies by gender, experience, educational attainment, and region of the country, leading us to conclude that there is no single African American labor market narrative. This has been increasingly the case in the years since 2000. Though the African American experience is not monolithic, our decomposition results reveal that the primary driver of the expansion and narrowing of these gaps has been changes in discrimination, unobservable skills, or some combination of the two. This term is likely capturing the ebb and flow of government enforcement in anti-discrimination and civil rights laws, or the growing importance of other unmeasured factors. In the post-2000 period, these forces have been even greater than the effects of the Great Recession, as the political and financial support necessary to fight labor market discrimination has continued to wane. Although for most groups wage gaps changed modestly in the years following the Great Recession, discrimination was the primary factor driving those changes. The other factor consistently contributing to the expansion of these wage gaps has been growing earnings inequality in general. Regardless of one’s race, gender, and labor market experience, the wages of most workers, especially less-skilled workers, have stagnated over much of this period, and this trend contributes to the widening of black-white wage gaps because the typical black worker is paid the wage of a low- to moderate-skilled white worker. While it was not directly addressed in this paper, future analysis of wage gaps for less-educated workers should incorporate the nonrandom selection associated with the rising trend in mass incarceration during the 1980s and 1990s. Patterns of imprisonment might suggest that the truncation in the wage scale associated with the departure of these potential workers may not have worsened since 2000. The ability to make these adjustments is currently limited by the scope of available data. Linking information on incarceration to individual records in the CPS and American Community Survey (ACS) files would be a major step toward generating estimates of the wage gap adjusted for past incarceration (both in terms of labor force participation and the penalty on wages). The evidence we present here has major implications for addressing racial inequality. In many ways, identifying wage gap trends and the factors contributing to them is the easy part. Actually taking the steps necessary to close and eliminate the gaps will require intentional and direct action. At a minimum, there must be consistently strong enforcement of anti-discrimination laws in the hiring, promotion, and pay of women and minority workers. This includes greater transparency in the ways decisions in these areas are made and ensuring that the processes available for workers to pursue violations of their rights are effective. Next, we discuss recommendations for supporting and strengthening these goals. The first recommendation involves the returns to education. Racial differences in college education continued to narrow after 2000, but our estimated gaps for college graduates indicate that just completing a bachelor’s degree or more will not reduce the black-white wage gap. Black college graduates have higher wages than African American high school graduates, but significant wage gaps between black and white college graduates have grown and persisted. It is wrong that as a society we send a message that you must get a college degree to obtain economic security, yet even then you will experience a sizeable earnings disadvantage. This erosion in opportunity started in the 1980s, but little has been done to address it. We speculate that part of the answer lies with challenges that all young college graduates face, but these challenges are more acute for African Americans and the communities in which they live. Our first recommendation, then, is that the Obama administration and the next president hold summits on minority college graduates. The purpose would be to convene policymakers, researchers, practitioners, current high school students, current college students, and recent graduates to identify and recommend ways to narrow the black-white wage gap among college graduates. Second, we urge the Bureau of Labor Statistics to work with organizations directly engaged in the education, workforce development, and employment of African Americans to identify the “unobservable measures” that impact the black-white wage gap and devise ways to include them in the CPS or ACS so that we can obtain population-based estimates of the wage gap adjusted for these additional measures. In practice, this step would involve collecting some of the detailed information found in the National Longitudinal Survey of Youth for the CPS and/or the ACS. For example, it would be useful to have more information about college graduate choices and experiences in the regular CPS and ACS or increase the wage sample in the October education supplement. It may also be time to consider funding a new NLS youth (ages 14 to 22) cohort. Third, we urge the Equal Employment Opportunity Commission to work with experts to develop metropolitan area measures of discrimination that could be linked to individual records in the ACS or CPS. The goal is to allow researchers to directly assess the role that local area discrimination plays in the wage setting of African Americans and whites. The creation of a report card that describes a metropolitan area’s racial “climate” could be useful for the public, and its mere publication could change the behaviors of employers. The National Urban League might consider this assessment as a part of its annual State of Black America series. Firm-specific pay data by race, ethnicity, and gender are essential to such an undertaking, but are not currently available. During the Clinton administration the Department of Labor implemented a pilot equal employment opportunity survey to provide regulators in the Office of Federal Contract Compliance Programs with wage and promotion data for employers by race, ethnicity, and gender. The objective of the survey was to enable the agency to better target its resources in addressing racial and gender wage discrimination. After commissioning several studies of the data collected through the pilot, the office concluded that the survey failed to provide the utility anticipated and eliminated it. Although the data were not an effective tool for targeting enforcement at specific firms, the information did reveal evidence of racial and gender pay inequities among workers in the same occupations and with the same work experience at the same firms (Rawlston and Spriggs 2001). We recommend that the Department of Labor reinstate the survey or a similar instrument for the purpose of collecting detailed pay data at the firm level. Fourth, since growing earnings inequality overall has consistently contributed to the expansion of racial wage gaps, we have to address the broader problem of stagnant wages by raising the federal minimum wage, creating new work scheduling standards, and rigorously enforcing wage laws aimed at preventing wage theft. The Fight for 15 campaign has been instrumental in securing minimum-wage increases in a number of states and municipalities and the Department of Labor’s recent updating of the overtime income threshold will directly benefit 12.5 million workers. Both are major steps in this direction. We also need to strengthen the ability of workers to bargain with their employers, a right that has been substantially weakened since the 1980s through, for example, laws passed by state legislatures that restrict public employees’ collective bargaining rights or the ability to collect “fair share” dues through payroll deductions. We need to push back against the proliferation of forced arbitration clauses that require workers, as a condition of employment, to give up their right to sue in public court. We need greater protections for freelancers and workers in “gig” employment relationships. To this end, in New York the Freelancers Collective secured the introduction of legislation that would provide independent workers the same legal recourse as employees in traditional employment situations. And the recent agreement between Uber and the International Association of Machinists may begin to shift the nexus of power from gig companies to their employees. Finally, we must engage macroeconomic policy to reduce these disparities. Wilson (2015) finds that, on average, the wages of black workers are more responsive than those of white workers to aggregate labor market changes. A doubling of the national unemployment rate is estimated to reduce real hourly wages by at least 8 percent for the median black worker compared with 3 percent for the median white worker. Carpenter and Rodgers (2004) and Rodgers (2008) show that the employment-population ratio of minorities is more sensitive than that of whites to contractionary monetary policy. Thus, the Federal Reserve should pursue monetary policy that targets full employment, with wage growth that matches productivity gains. As former National Urban League President Hugh Price has said, we as a society know what we need to do to address persistent racial wage and employment inequality. We just need the political courage. Valerie Rawlston Wilson is director of the Economic Policy Institute’s Program on Race, Ethnicity, and the Economy (PREE), a nationally recognized source for expert reports and policy analyses on the economic condition of America’s people of color. Prior to joining EPI, Wilson was an economist and vice president of research at the National Urban League Washington Bureau, where she was responsible for planning and directing the bureau’s research agenda. She has written extensively on various issues impacting economic inequality in the United States—including employment and training, income and wealth disparities, access to higher education, and social insurance—and has also appeared in print, television, and radio media. She has a Ph.D. in economics from the University of North Carolina at Chapel Hill. William M. Rodgers, III is professor of public policy at the Bloustein School for Planning and Public Policy. He is also chief economist at the Heldrich Center for Workforce Development. He is board chair of the National Academy of Social Insurance and serves on the U.S. Bureau of Labor Statistics’ Technical Advisory Committee. Prior to coming to Rutgers, in 2000, Rodgers served as chief economist at the U.S. Department of Labor, appointed by Alexis Herman, U.S. secretary of labor. His research interests include income inequality, with a focus on labor and workforce development issues. Rodgers’s expertise is frequently called upon by journalists for articles in The New York Times, The Wall Street Journal, and other publications and he is a frequent guest on numerous television and radio talk shows such as PBS’s Nightly Business Report, NBC’s Meet the Press and National Public Radio’s Market Place. He has a Ph.D from Harvard University. where lnWi denotes the natural logarithm of hourly earnings; Xi denotes a matrix of observed attributes such as educational attainment; Zi denotes a matrix of community attributes, such as the region of the country or labor market conditions; βi and γi denote the vector of regression coefficients that capture the economic returns of each attribute; and ɛi is the standardized residual (meaning that it is distributed with a mean of zero and variance of one) and σi is the residual standard deviation of wages. the right-hand side captures the predicted log wage gap due to differences in observable attributes such as educational attainment and experience and the predicted log wage difference associated with racial differences in local labor markets. The third term measures the residual gap, which depends on the residual prices and the error terms. When evaluated at the means, the residual gap depends on the amount of white residual wage inequality (σw) and the mean black position in the white residual wage distribution (θb). ΔlnWt = ΔΧtβwt + ΔΖtγwt + σwtΔθt. ΔlnWt’ = ΔΧt’ βwt’ + ΔΖt’ γwt’ + σwt’ Δθt’ . ΔlnWt — ΔlnWt’ = (ΔΧt βwt — ΔΧt ‘ βwt’ ) + (ΔΖtγwt — ΔΖt’ γwt’ ) + (σwtΔθt — σwt’ Δθtt’ ). Finally, we choose year t’ and white prices as the reference wage structure by adding and subtracting the term (ΔΧt βwt’ + ΔΖtγwt’ + σwt’ Δθt’ ) from the right-hand side. This manipulation yields the following trend decomposition equation. To address the common index problem that plagues this type of decomposition, we replace the t’ values with the series average of each component (series length = 36).23 Thus, each component captures the change in a component’s year t value relative to its average over the whole period. The first and second terms on the right-hand side are measured quantities associated with educational attainment, experience, metro status, and region. The terms represent changes across time in observed racial-specific attributes, holding market returns fixed. The wage gap may narrow across time because the educational attainment and experience of blacks relative to whites narrows. The wage gap may also narrow because blacks are advantaged by working in faster-growing regions, such as the South. The third and fourth terms, labeled measured prices, capture changes in market returns, holding observed characteristics fixed. For example, an increase over time in returns to skills will cause the overall wage gap to expand if employers view blacks on average as having weaker communication or “soft” skills. The fifth term is labeled “residual quantities.” The term measures changes in unobserved race-specific characteristics, which result in changes in the percentile ranking of blacks in the white residual wage distribution. Such unmeasured characteristics can include racial differences in labor force attachment due to incarceration, differences in unobserved skills, and wage discrimination by race. As an example, reduced racial differences in these attributes could cause the ranking of the average black residual wage to rise from the 35th percentile to the 40th percentile of the white residual wage distribution, all else equal. The final term, considered the residual prices, reflects changes in white residual wage inequality. One can think of the last term as changes in the wage penalty for having a position below the mean of the white residual wage distribution. 1. Based on authors’ analysis of 2015 CPS-ORG microdata. 2. Also see Grogger (1996). For a trend analysis of employment of black-white differences in employment, see Holzer and Offner (2006). 3. The young men in the NLSY survey were 14 to 22 years old in 1979. 4. Change to 2015, based on author’s analysis of Current Population Survey Annual Social and Economic Supplement (CPS ASEC) Historical Educational Attainment Tables, various years. 6. Based on authors’ analysis of 1989–2015 CPS-ORG microdata. 7. Metro status is used to distinguish people who live in a metropolitan statistical area (MSA), as identified by the Census Bureau, from those who don’t. This allows us to account for the fact that wages are typically higher in urban or metro areas than in rural areas. 8. Since 1992, educational attainment is measured in degree attained rather than years of schooling. To construct an estimate of years of schooling to use in the calculation of potential experience, we compute the average years of schooling for a given degree attained and assign that value to respondents who report that degree. For years prior to 1992, we follow this same conversion pattern to make the two periods fully comparable. 9. In June-August 1995, the format of the CPS household identifier was changed, resulting in suppression of geographic identifiers for those three months and affecting roughly 17,000 observations. In order to retain these observations, we also include a dummy variable for missing metro status. 10. While the CPS does not allow us to follow the same individuals over time, the cohort representative of new entrants beginning in 1979 would be the same age as the cohort representative of more experienced workers by 1990. 11. Based on the Bureau of Labor Statistics’ usual weekly earnings series for full-time workers; in 2014, African American women earned 11 percent less than African American men but 47 percent less than white men. 12. The wage gaps within experience categories should be interpreted with caution because of the well-known biases associated with using potential experience versus actual experience and changes in the measurement of educational attainment, beginning with the 1992 CPS (see note 6 for an explanation). 13. The technique used in this paper attributed to Juhn, Murphy, and Pierce (1991) has its origins to Oaxaca (1973) and Blinder (1973). 14. Self-employed individuals are excluded. 15. We also estimated decompositions using business cycle peak years and the late 1990s economic boom to delineate sub-periods: 1979–1989, 1989–1995, 1995–2000, 2000–2007, and 2007–2014. Since some of these break points intersected trends in the expansion and narrowing of wage gaps, we opted to present decompositions based on break points that were more consistent with clear periods of change. In addition to this variation, we used 2009, coinciding with the end of the Great Recession, as a post-2000 break point. All of these estimates are available from the authors upon request. 16. Between 1979 and 1985, the median new-entrant black male wage fell from the 35th percentile of the new-entrant white residual wage distribution to the 32nd percentile. The median new-entrant black female wage fell from the 41st percentile to the 40th. Estimates of white wage percentile positions of black workers available from the authors upon request. 17. Between 1996 and 2000, the median new-entrant black male wage rose from the 32nd percentile of the white residual wage distribution to the 38th percentile and the median black female wage rose from the 39th to the 46th percentile. 18. After peaking at the 38th percentile of the white wage distribution in 2000, the median new-entrant black male wage fell to the 35th percentile in 2015. The median new­-entrant black female wage fell from the 46th percentile in 2000 to the 40th percentile in 2015. 19. Gould and Shierholz (2011) find that wages in right-to-work states are 3.2 percent lower than those in non–right-to-work states. Further, the negative impact on black workers’ wages (-4.8 percent) is greater than that for white workers (-3.0 percent). Given that the majority of the 25 right-to-work states are in the South, this finding is consistent with the existence of larger black-white wage gaps there than other regions of the country. While right-to-work laws have long been typical of Southern labor market policy (nearly all laws were passed in the 1940s and 1950s), these laws have begun to creep more into states outside the South. Since 2000, five states—Oklahoma (2001), Indiana (2012), Michigan (2013), Wisconsin (2015), and West Virginia (2016)—have passed right-to-work laws. This recent resurgence of right-to-work laws could potentially be a contributing factor for future wage trends in non-Southern states, but doesn’t explain the trend of rapidly growing wage gaps in non-Southern states during the 1980s and 1990s. 20. For the metro areas with non-missing values, we perform our decomposition with and without controlling for the metro area unemployment rate and then compare the two sets of results. Estimates are available from the authors upon request. 21. Juhn, Murphy, and Pierce (1991) examine the effects of occupational distribution between 1963 and 1987 using both the three-digit and single-digit codes and conclude that the results were similar. Additionally, declining racial segregation in the workplace slowed considerably after the 1980s (Spriggs and Williams 1996; Rawlston and Spriggs 2002; Stainback and Tomaskovic-Devey 2012). Therefore, although occupational segregation may explain a significant portion of racial wage disparities in a given year, we expect the effect on changes in the wage gap over time to be minimal. 22. The technique used in this paper attributed to Juhn, Murphy, and Pierce (1991) has its origins in Oaxaca (1973) and Blinder (1973). 23. See, for example, Y. Rodgers (2006). Anderson, D., and D. Shapiro. 1996. “Racial Differences in Access to High-Paying Jobs and the Wage Gap between Black and White Women.” Industrial & Labor Relations Review 49(2): 273–86. Betsey, Charles. 1994. “Litigation of Employment Discrimination under Title VII: The Case of African-American Women.” American Economic Review 84(2):98–102. Bivens, Josh, Elise Gould, Lawrence Mishel, and Heidi Shierholz. 2014. Raising America’s Pay: Why It’s Our Central Economic Policy Challenge. Washington, D.C.: Economic Policy Institute. Bivens, Josh, and Lawrence Mishel. 2015. Understanding the Historic Divergence between Productivity and a Typical Worker’s Pay: Why It Matters and Why It’s Real. Washington, D.C.: Economic Policy Institute. Blau, Francine D., and Andrea Beller. 1992. “Black-White Earnings over the 1970s and 1980s: Gender Differences in Trends.” Review of Economics and Statistics 74(2): 276–86. Blinder, Alan S. 1973. “Wage Discrimination: Reduced Form and Structural Estimates.” Journal of Human Resources 8(4): 436–55. Bound, John, and Richard Freeman. 1992. “What Went Wrong? The Erosion of Relative Earnings and Employment among Young Black Men in the 1980s.” Quarterly Journal of Economics 107: 201–32. Carlson, Leonard, and Caroline Swartz. 1988. “The Earnings of Women and Ethnic Minorities, 1959–1979.” Industrial & Labor Relations Review 41(4): 530–46. Carpenter, S. B. and W. M. Rodgers III. 2004. “The Disparate Labor Market Impacts of Monetary Policy.” Journal of Policy Analysis and Management 23: 813–30. Conrad, C. 2001. “Racial Trends in Labor Market Access and Wages: Women.” America Becoming: Racial Trends and Their Consequences 2: 124–51. Cunningham, James S., and Nadja Zalokar. 1992. “The Economic Progress of Black Women, 1940–1980: Occupational Distribution and Relative Wages.” Industrial & Labor Relations Review 45(3): 540–55. Darity, William A., and Patrick Mason. 1998. “Evidence on Discrimination in Employment: Codes of Color, Codes of Gender.” Journal of Economic Perspectives 12(2): 63–90. England, P., K. Christopher, and L. L. Reid. 1999. “Gender, Race, Ethnicity, and Wages.” In Latinas and African American Women at Work: Race, Gender, and Economic Inequality, ed. Irene Browne, pp. 139–82. New York, N.Y.: Russel Sage Foundation. Fosu, Augustin K. 1992. “Occupational Mobility of Black Women, 1958–1981: The Impact of Post-1964 Antidiscrimination Measures.” Industrial & Labor Relations Review 45(2): 281–94. Freeman, Richard B., and William M. Rodgers III. 2000. “Area Economic Conditions and the Labor Market Outcomes of Young Men in the 1990s Expansion.” In Prosperity for All: The Economic Boom and African Americans, eds. Cherry, Robert and William M. Rodgers, pp. 50­–87. New York, N.Y.: Russell Sage Foundation. Grogger, J. 1996. “Does School Quality Explain the Recent Black/White Wage Trend?” Journal of Labor Economics, pp. 231–53. Heckman, James J., and Brook Payner. 1989. “Determining the Impact of Federal Antidiscrimination Policy on the Economic Status of Blacks: A Study of South Carolina.” National Bureau of Economic Research Working Paper # 2854. Holzer, Harry, Paul Offner and Elaine Soresen. 2004. “Declining Employment among Young Black Less-Educated Men: The Role of Incarceration and Child Support.” Washington, DC: Urban Institute. Juhn, Chinhui, Kevin M. Murphy, and Brooks Pierce. 1991. “Accounting for the Slowdown in Black-White Wage Convergence.” In Workers and Their Wages: Changing Patterns in the United States, ed. Marvin H. Kosters, 107-43. Washington D.C.: American Enterprise Institute. Leonard, Jonathan S. 1990. “The Impact of Affirmative Action Regulation and Equal Employment Law on Black Employment.” Journal of Economic Perspectives 4(4): 47­–63. Maxwell, Nan L. 1994. “The Effect on Black-White Wage Differences of Differences in the Quantity and Quality of Education.” Industrial & Labor Relations Review 47(2): 249–64. McCrate, Elaine and Laura Leete. 1994. “Black‐White Wage Differences among Young Women, 1977–86.” Industrial Relations: A Journal of Economy and Society 33(2):168–83. Neal, Derek. 2004. “The Measured Black-White Wage Gap among Women Is Too Small.” Journal of Political Economy 112(S1): S1-S28. Neal, Derek A., and William R. Johnson. 1996. “The Role of Premarket Factors in Black-White Wage Differences.” Journal of Political Economy 104(5): 869–95. Neal, D., and A. Rick. 2014. “The Prison Boom and the Lack of Black Progress after Smith and Welch.” Cambridge, Mass. : National Bureau of Economic Research Working Paper # 20283. O’Neill, June. 1990. “The Role of Human Capital in Earnings Differences between Black and White Men” Journal of Economic Perspectives 4(4): 25–45. Rawlston, Valerie, and William Spriggs. 2001. “Pay Equity 2000: Are We There Yet?” Special Research Report (SRR-02-2001). Washington DC: National Urban League Institute for Opportunity and Equality. Rawlston, Valerie, and William Spriggs. 2002. “A Logit Decomposition Analysis of Occupational Segregation: An Update for the 1990s of Spriggs and Williams.” Review of Black Political Economy 29: 91–96. Rodgers, William M. 2006. “Male White-Black Wage Gaps, 1979–1994: A Distributional Analysis.” Southern Economic Journal 72(4): 773–93. Rodgers, William M., III, and William Spriggs. 1996. “What Does the AFQT Really Measure: Race, Wages, Schooling and the AFQT Score.” Review of Black Political Economy 24(4): 13–46. Rodgers, William. M., III, and William Spriggs. 2001. “Accounting for the Racial Gap in AFQT Scores: Comment on Nan L. Maxwell, ‘The Effect on Black-White Wage Differences of Differences in the Quantity and Quality of Education’.” Industrial & Labor Relations Review 55: 533. Rodgers, Yana V. 2006. “A Primer on Wage Decompositions in the Analysis of Labor Market Discrimination.” In Handbook on the Economics of Discrimination, ed. William M. Rodgers III, 11-28. Northampton Mass. : Edward Elgar Publishing. Spriggs, William, and Rhonda Williams. 1996. “A Logit Decomposition Analysis of Occupational Segregation: Results for the 1970s and 1980s.” Review of Economics and Statistics 78: 348–55. Stainback, Kevin, and Donald Tomaskovic-Devey. 2012. Documenting Desegregation: Racial and Gender Segregation in Private-Sector Employment since the Civil Rights Act. New York, N.Y.: Russell Sage Foundation). Zalokar, Nadka. 1990. The Economic Status of Black Women: An Exploratory Investigation (No. 34). Washington, D.C.: U.S. Commission on Civil Rights.